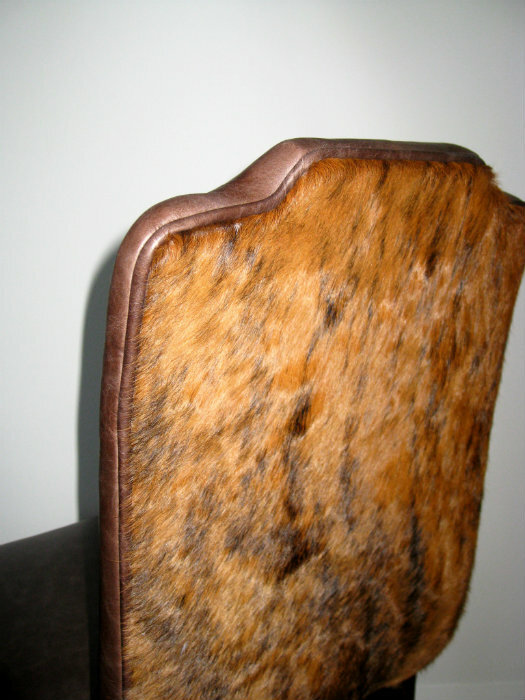 Please click on one of the images to enlarge. 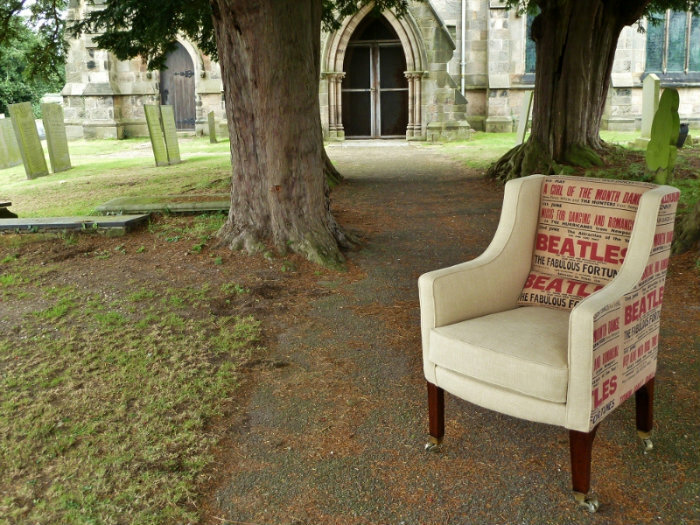 A late Edwardian wing chair with arched padded back and scroll arms. 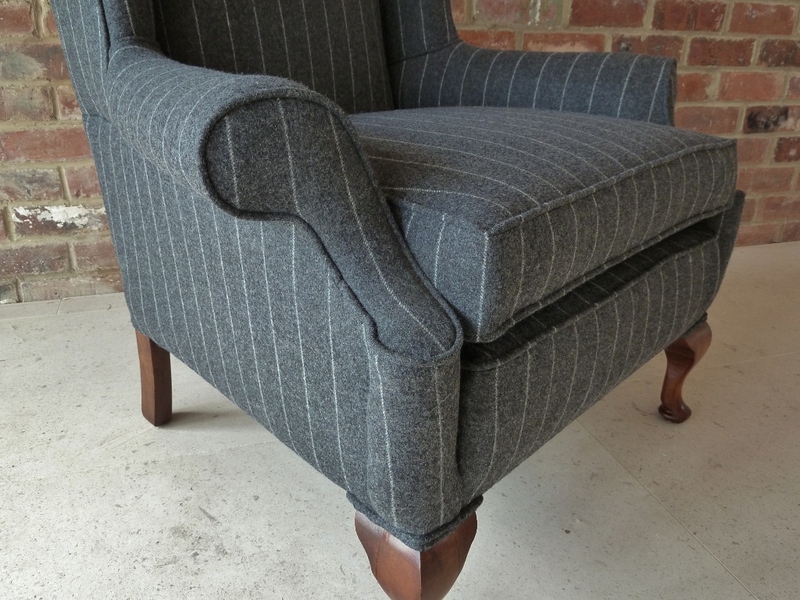 The seat interior has been replaced for comfort and the chair upholstered in Moon 100% wool, pin stripe material. 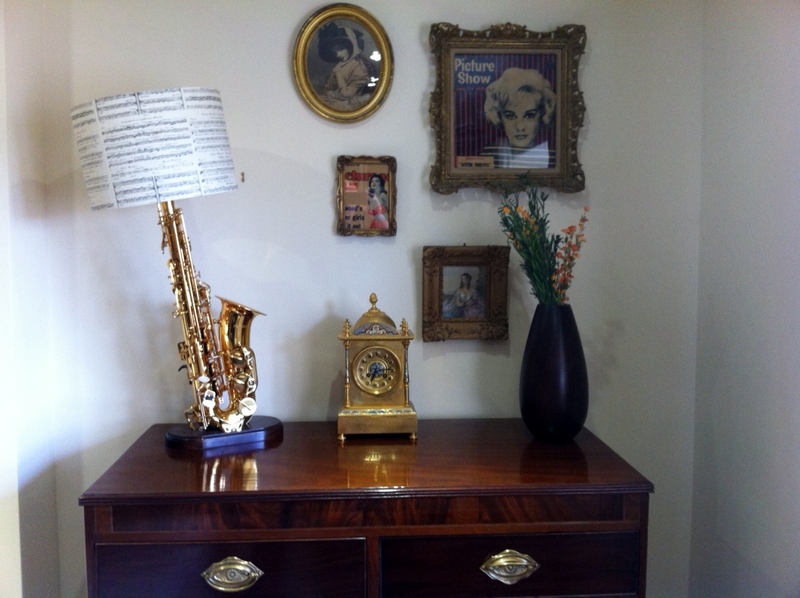 Attractive early Victorian rosewood chaise longue, on turned legs and porcelain castors. 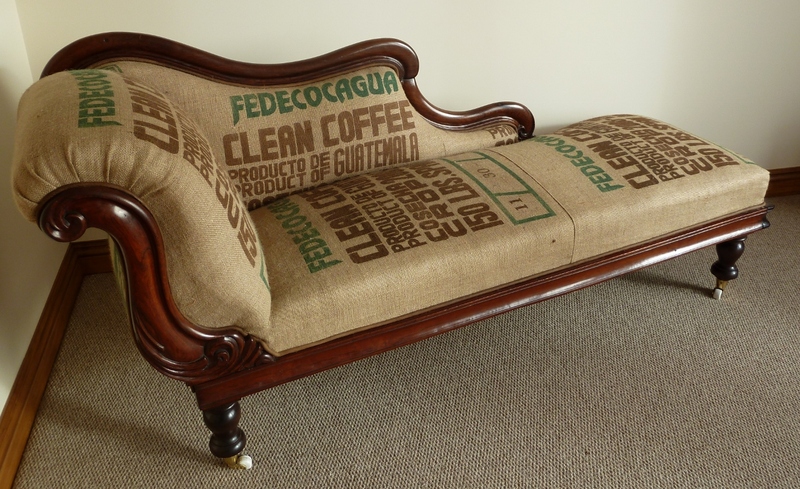 The chaise has been upholstered using recycled hessian coffee sacks from Guatemala and piped in a matching tan leather. 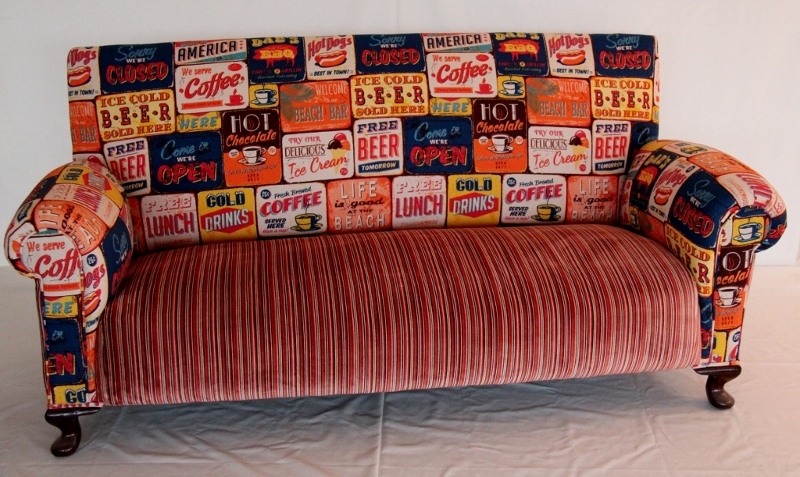 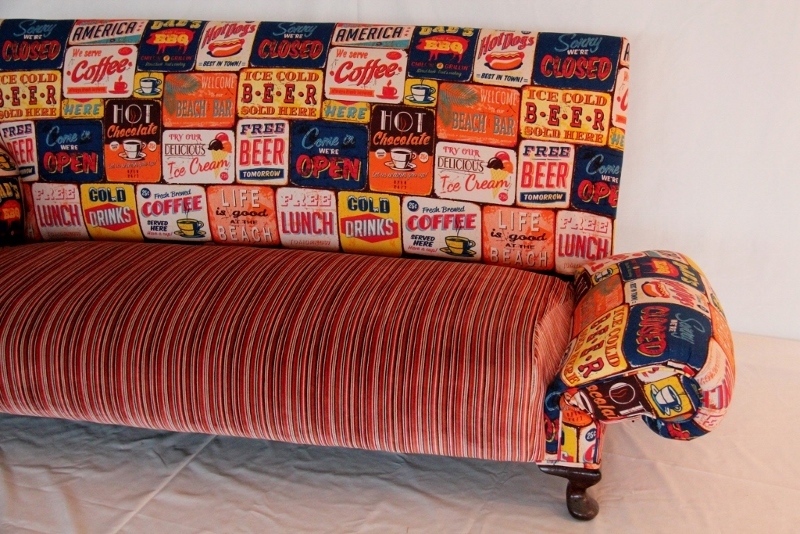 A striking Edwardian square backed, drop arm sofa sat on squat legs upholstered in printed cotton fabric of vintage American diner signs. 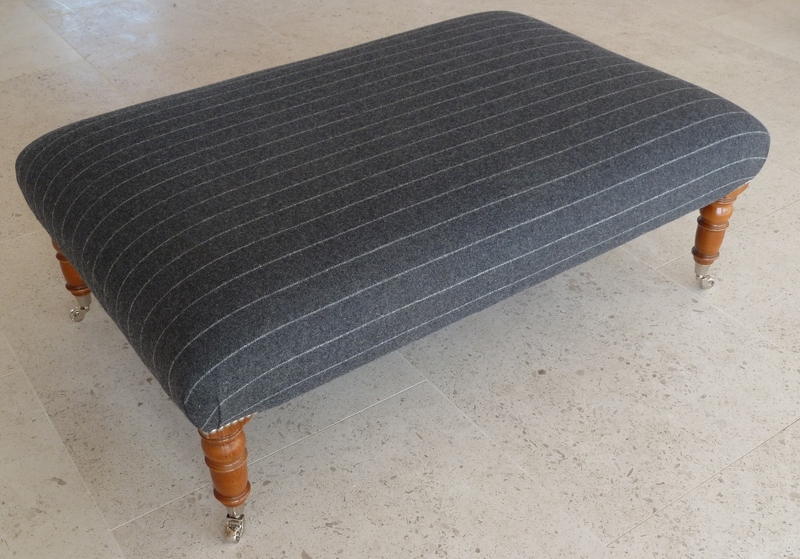 The seat and outside arms have been upholstered using a Clarke & Clarke velvet stripe. 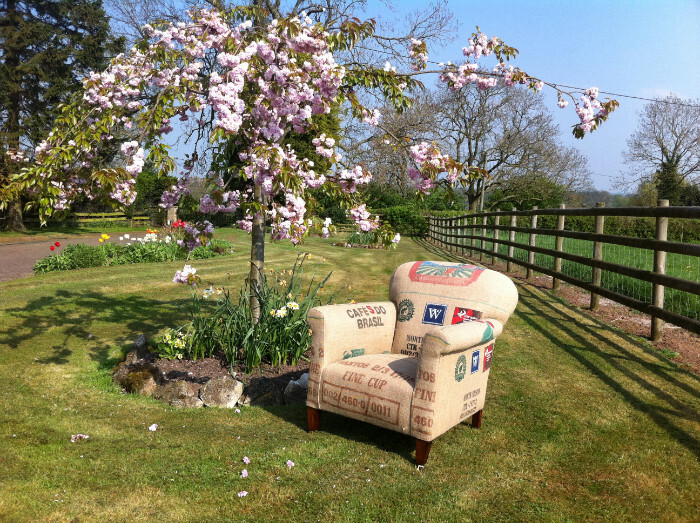 A well proportioned club chair on square mahogany tapered front legs and brass castors upholstered using old hessian coffee sacks. 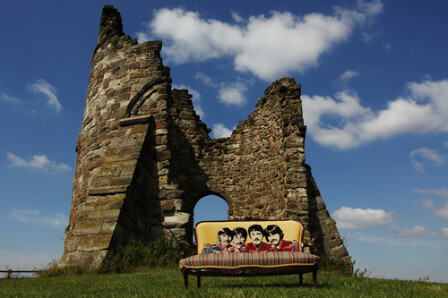 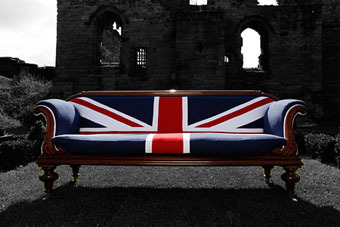 A modern phenomenon, most popular between the wars, but based on an early 17th century 'couch' at Knole in Kent. 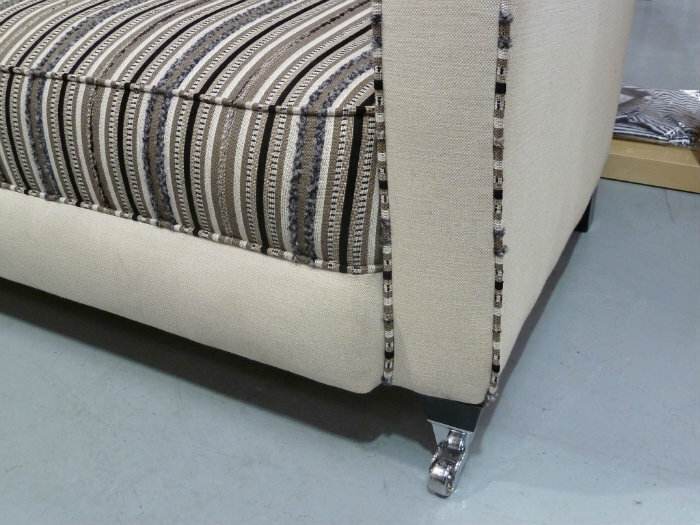 Rectangular box shape with arms hinging down from the seat frame to a comfortable angle, held in position by tasselled cords tied around large, fabric covered finials. 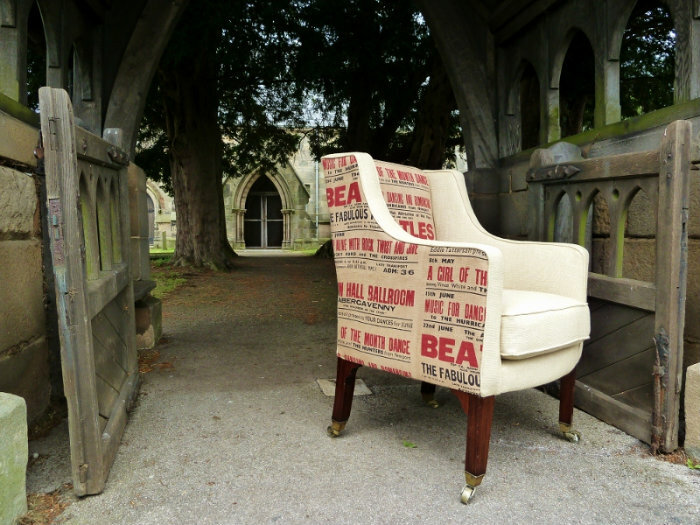 The seat cushions have been replaced for added comfort and traditional fabric has been juxtaposed with contrasting gold piping to transform this piece into the modern world. 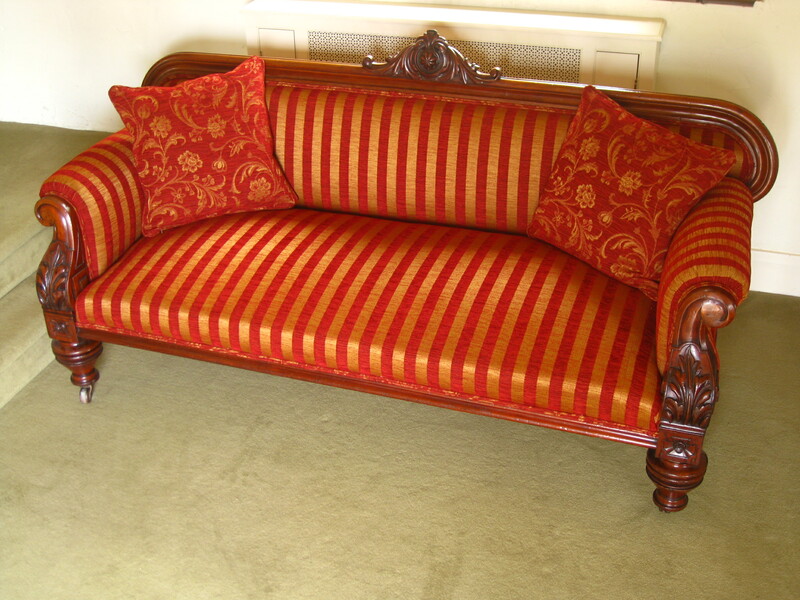 A striking walnut rectangular padded back sofa in a moulded and fluted frame carved with acanthus on tapering legs. 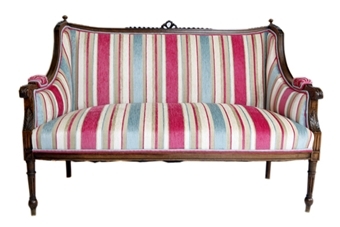 The outside is upholstered in Designers Guild fabric which complements the stripe. 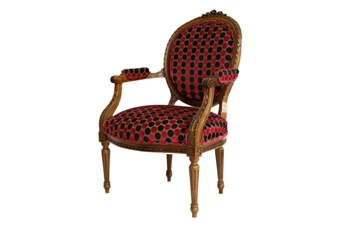 A carved walnut arm chair in the style of Louis XVI with oval padded back and serpentine seat in a moulded frame, crisply carved with ribbon twist on tapering fluted legs. 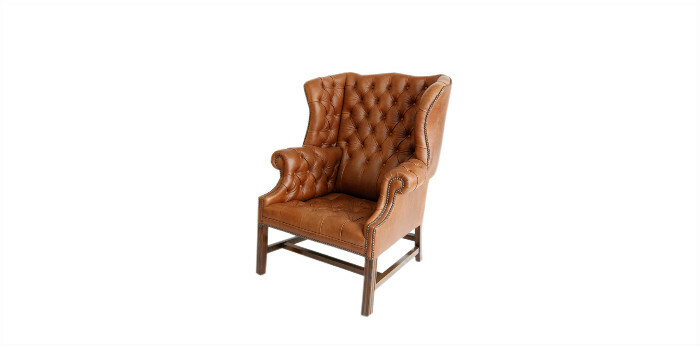 A beautiful proportioned crisply carved walnut tub chair with acanthus on tapering legs. 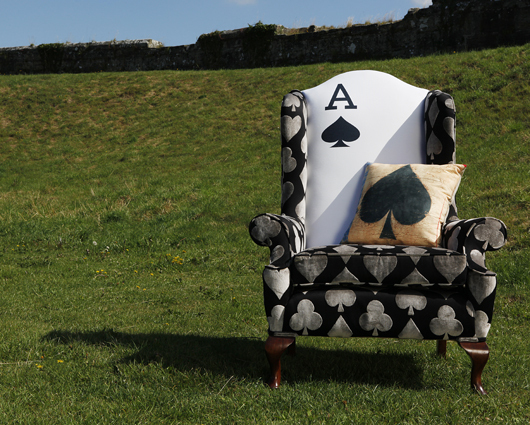 The outside is upholstered in Andrew Martin Showcase fabric with the inside in a matching suede and contrasting double piping. 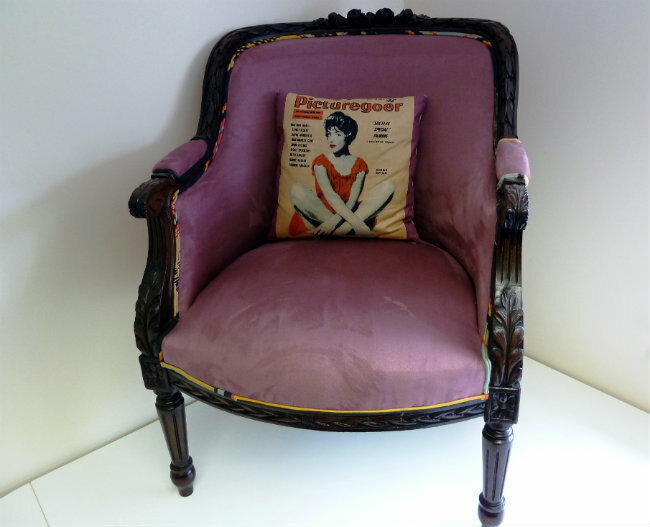 A lovely Georgian armchair on mahogany tapering legs and original brass castors. 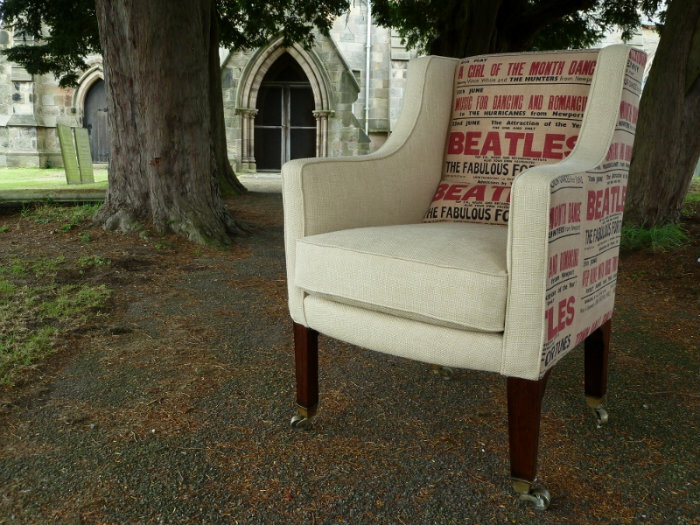 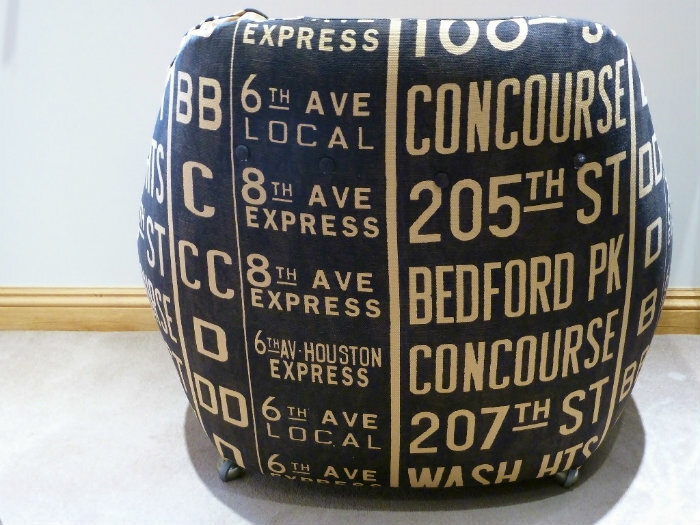 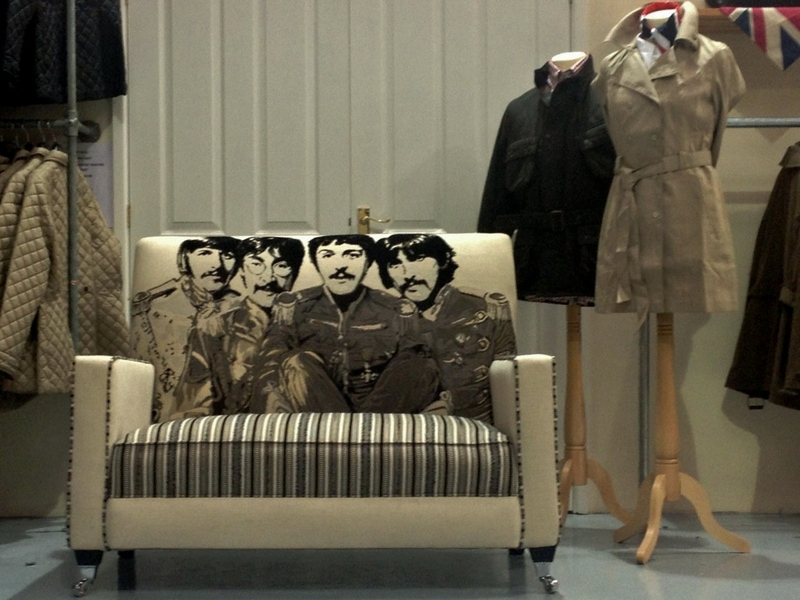 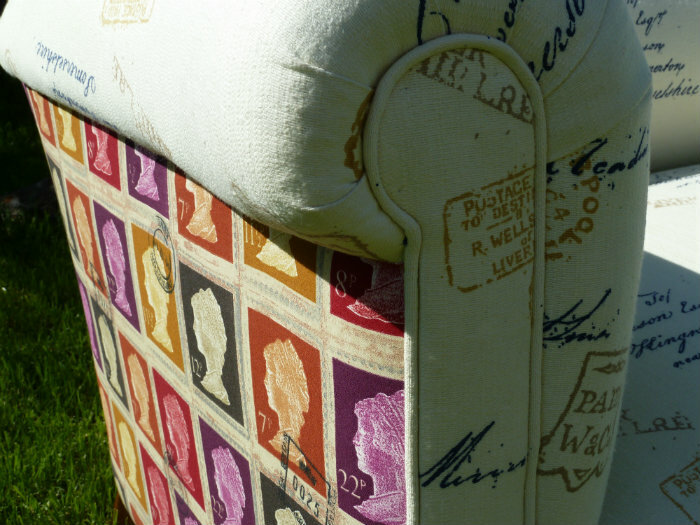 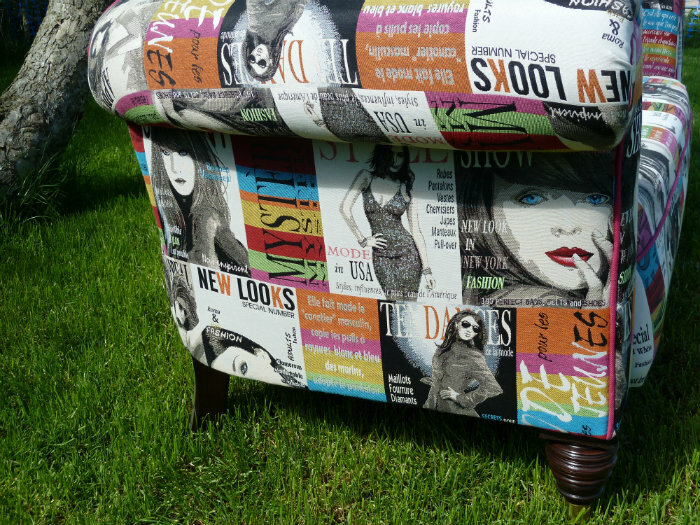 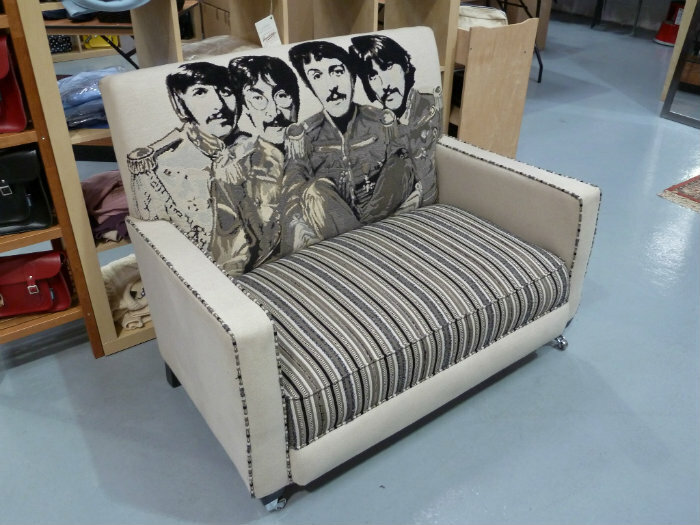 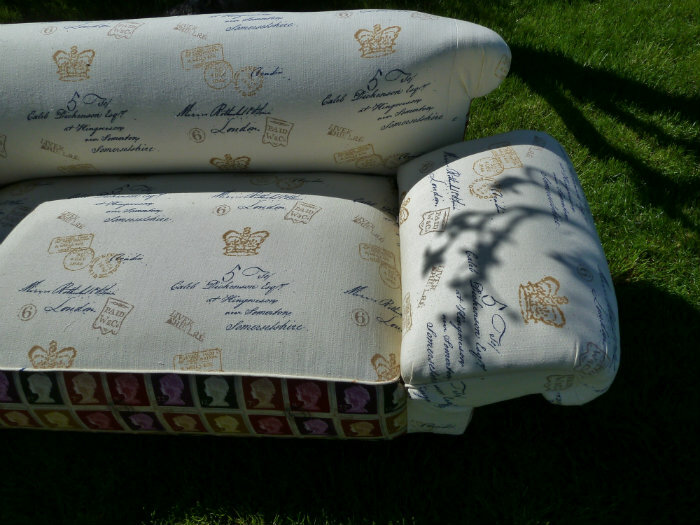 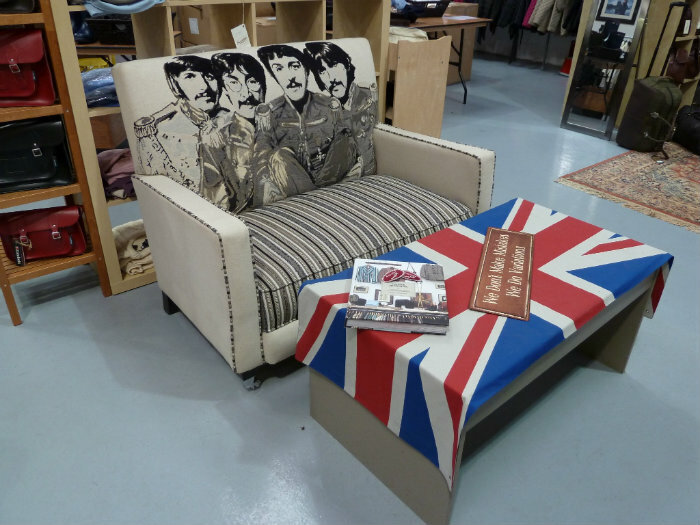 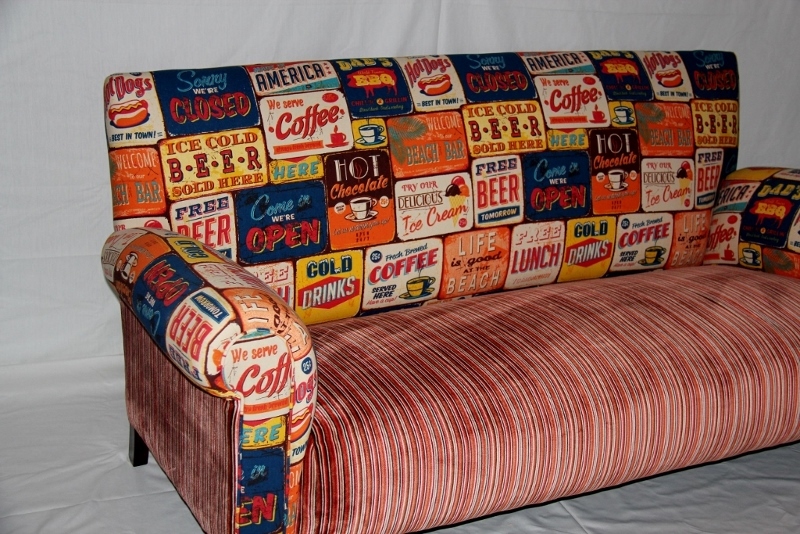 The outside arms and inside back is upholstered in Andrew Martin, Beatles headliner fabric. 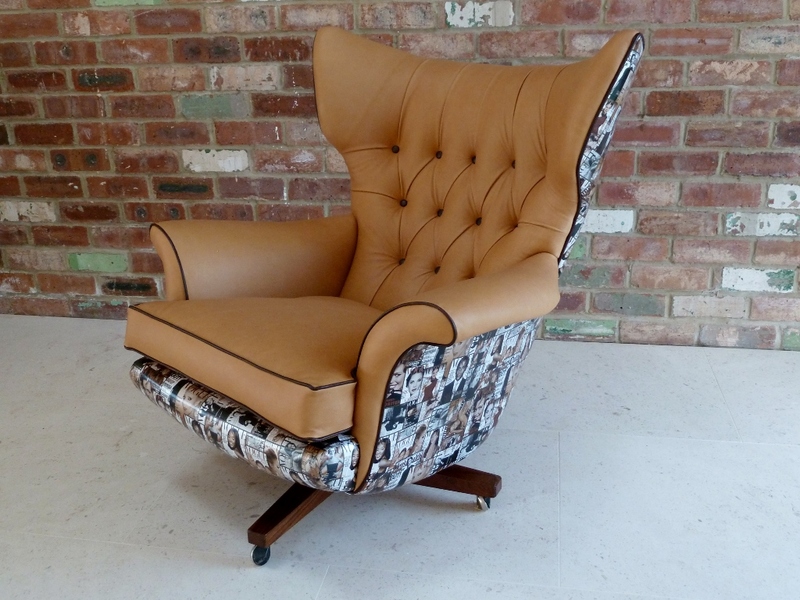 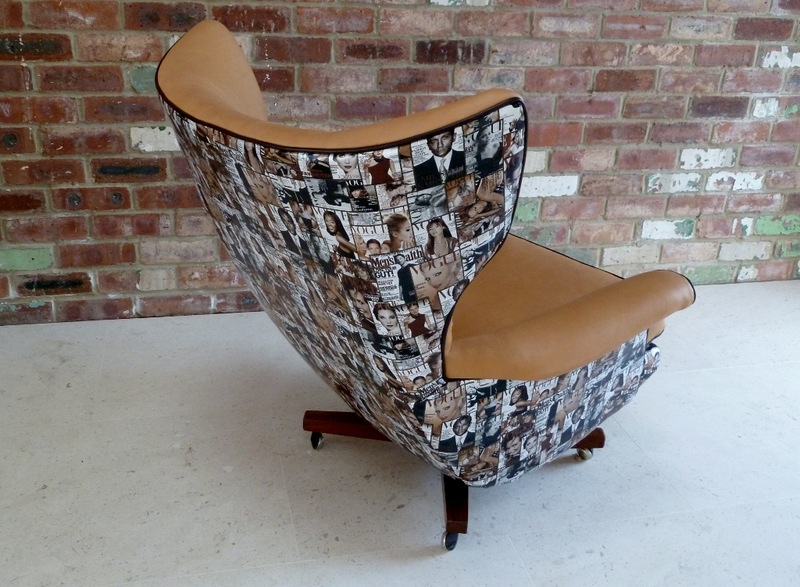 A stunning retro 1960's chair sat on shepherd castors. 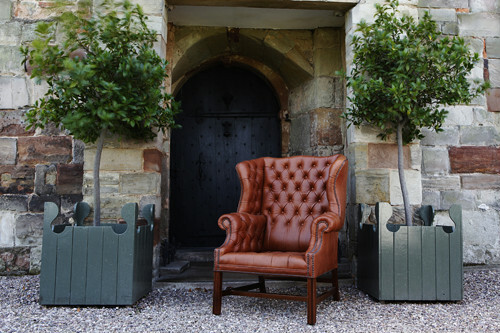 The outside body is upholstered in Andrew Martin concourse fabric with seat and back cushions deep buttoned in a matching soft Italian leather with contrasting buttons and piping. 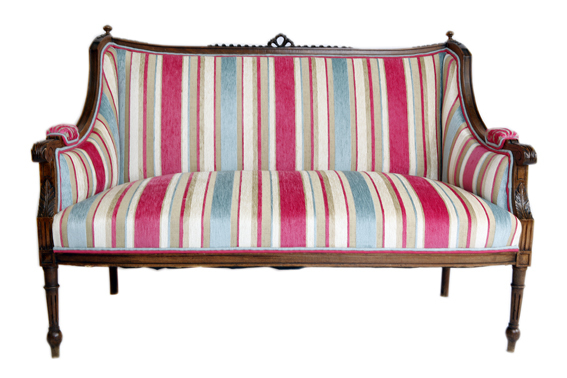 A beautifully proportioned late Edwardian sofa which has come out of a period property in the Peak District. 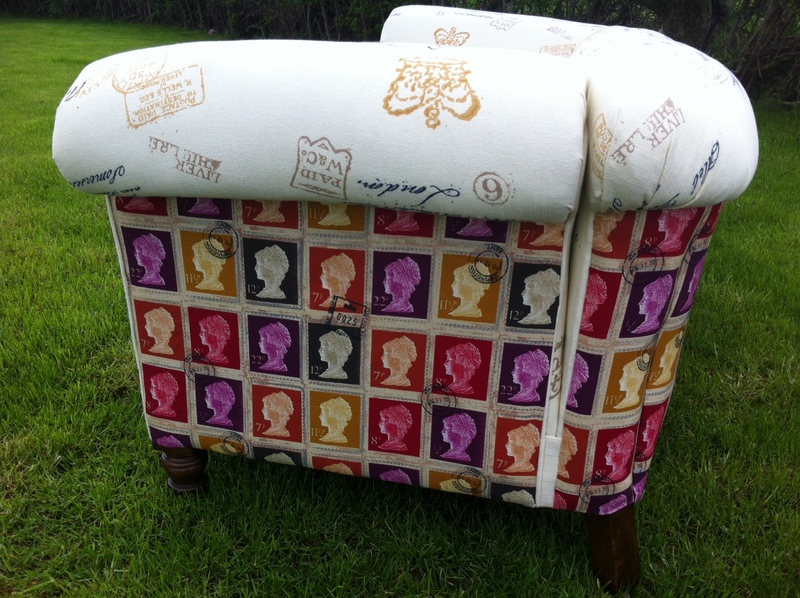 The sofa has been professionally restored and re-upholstered using Andrew Martin contrasting fabrics. 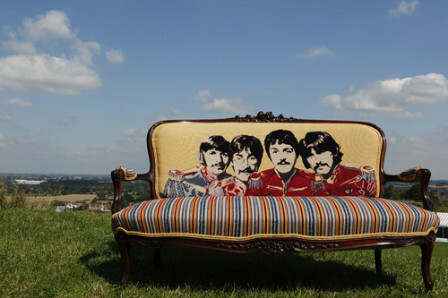 The feet have been replaced to add a more contemporary look. 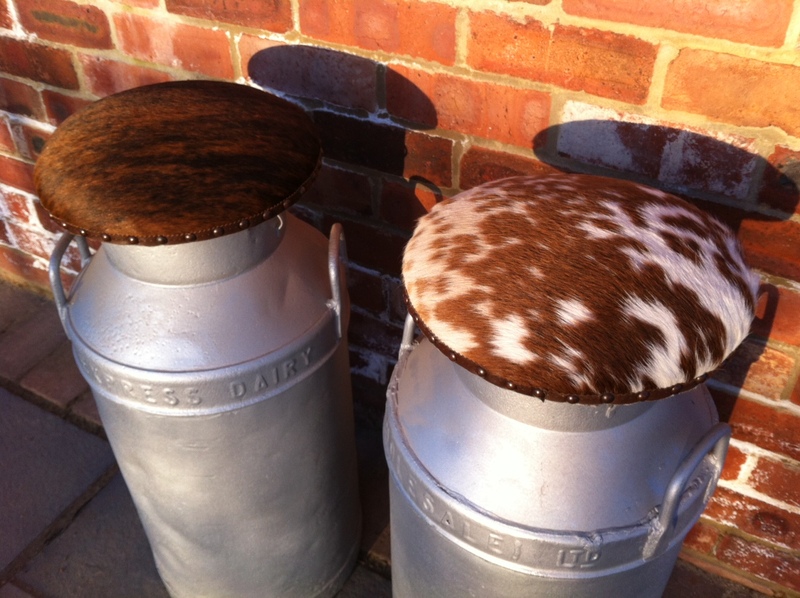 These original vintage milk churns have been shot blast and repainted, the tops have been converted into stools and covered using different cow hides. 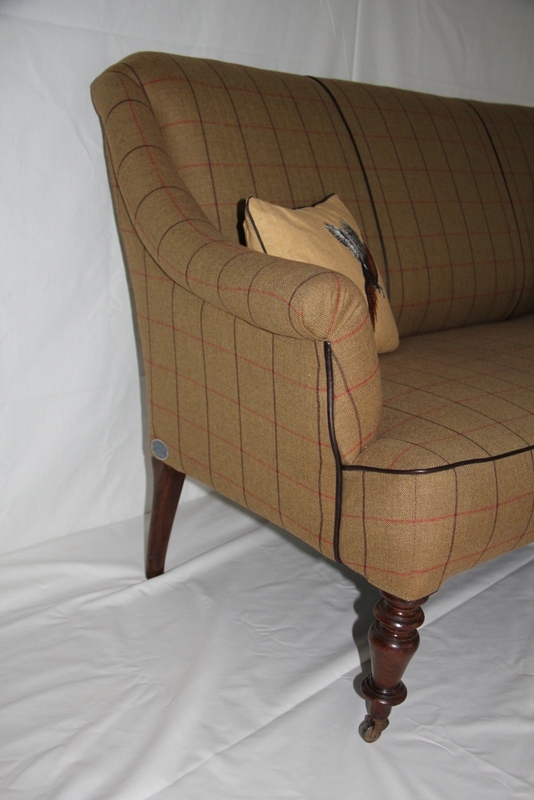 These are the perfect size for a bar stool and wood look stunning in a kitchen or country pub and restaurant. 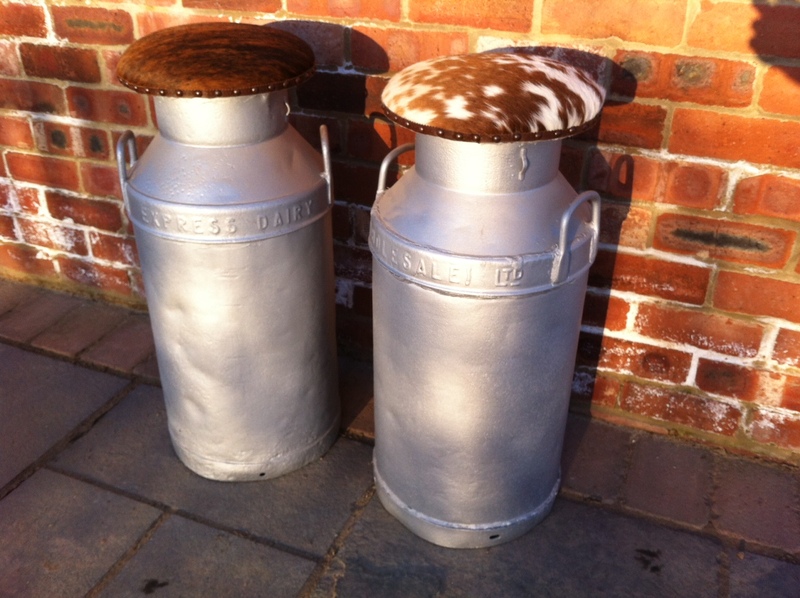 We always keep a great selection of Milk churns in all shapes and sizes which can be converted to your own specification. 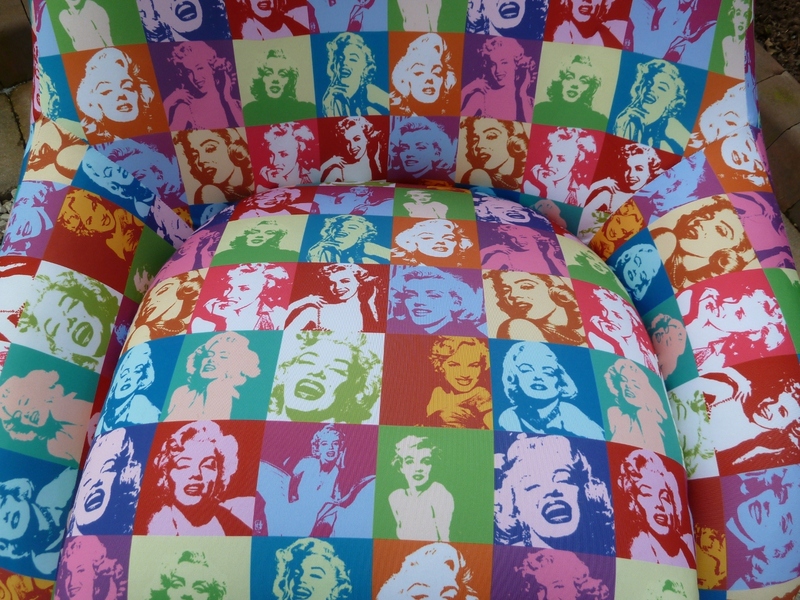 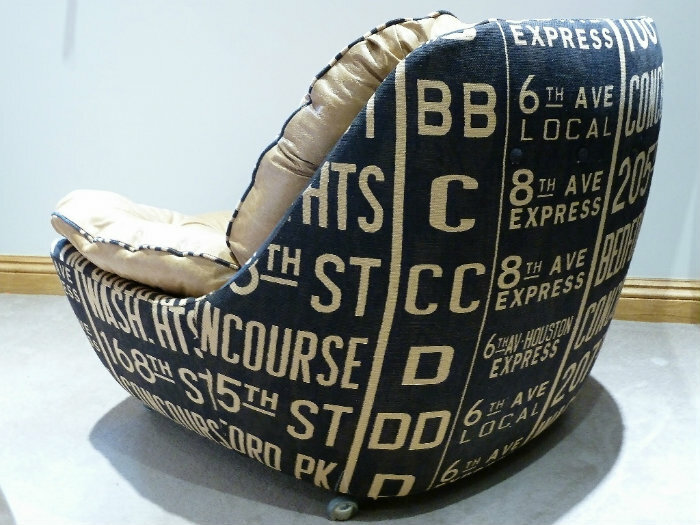 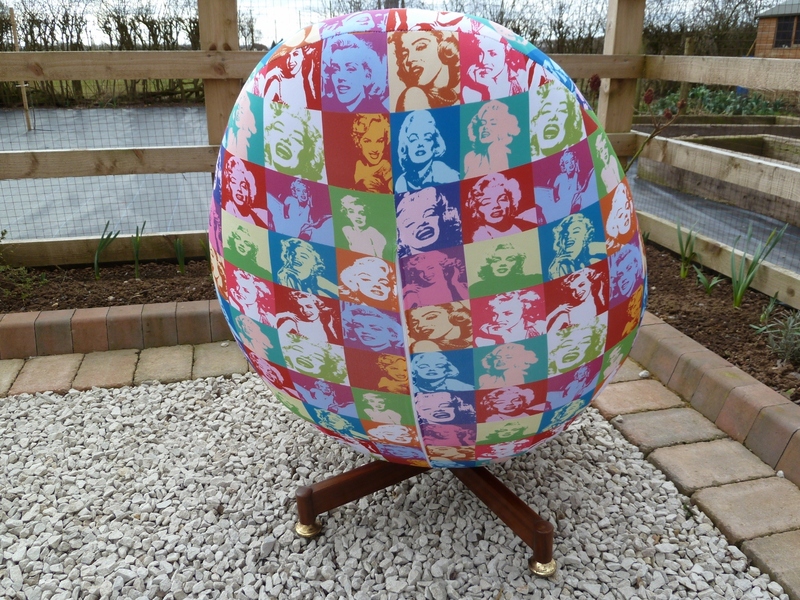 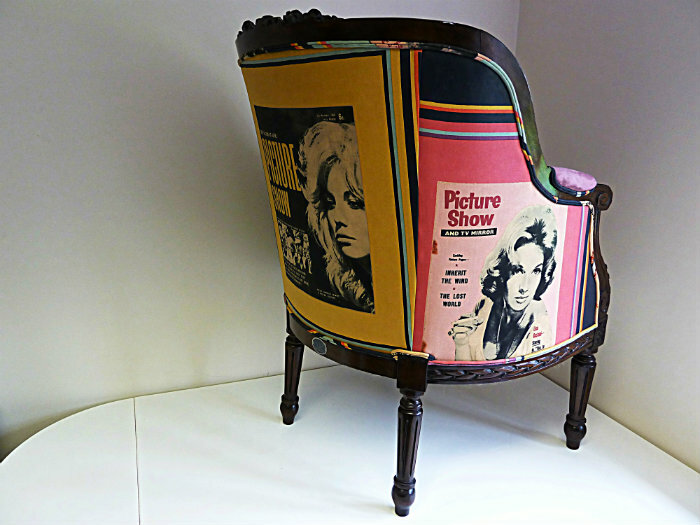 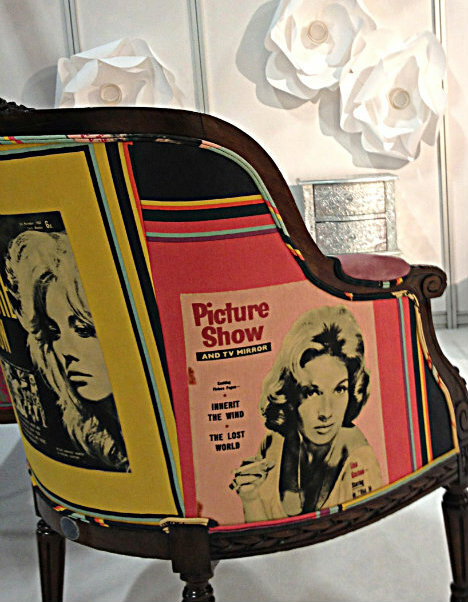 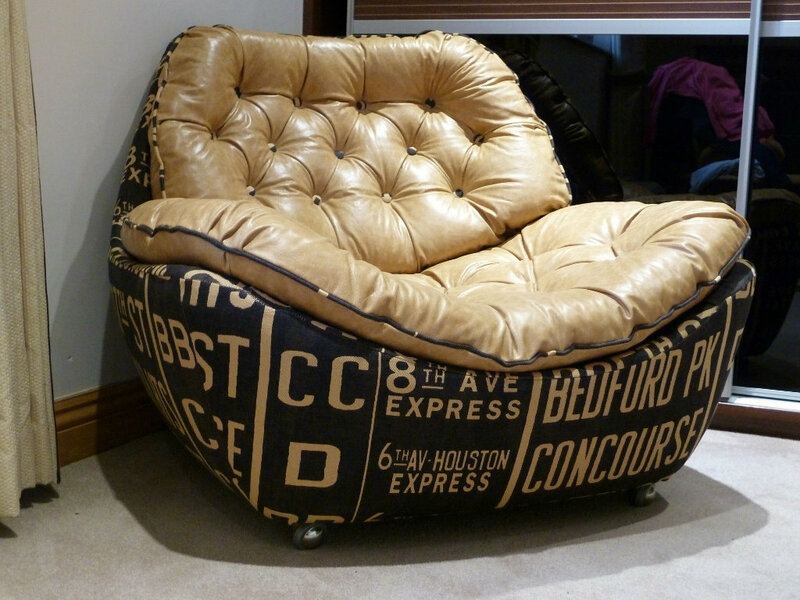 This iconic, original Greaves & Thomas swivel egg chair has been re-covered using a Marilyn Monroe fabric in the style of Andy Warhol. 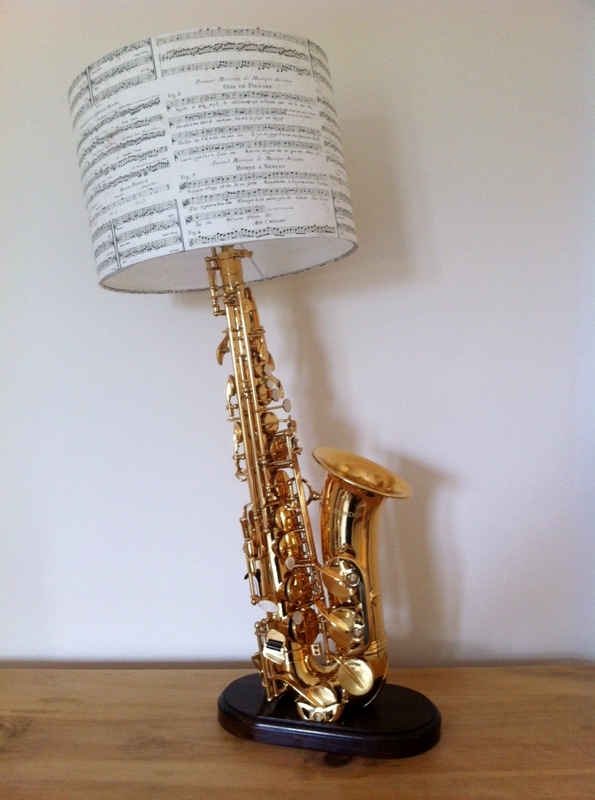 This non-playing saxophone has been mounted on a polished wooden base and converted into a contemporary lamp. 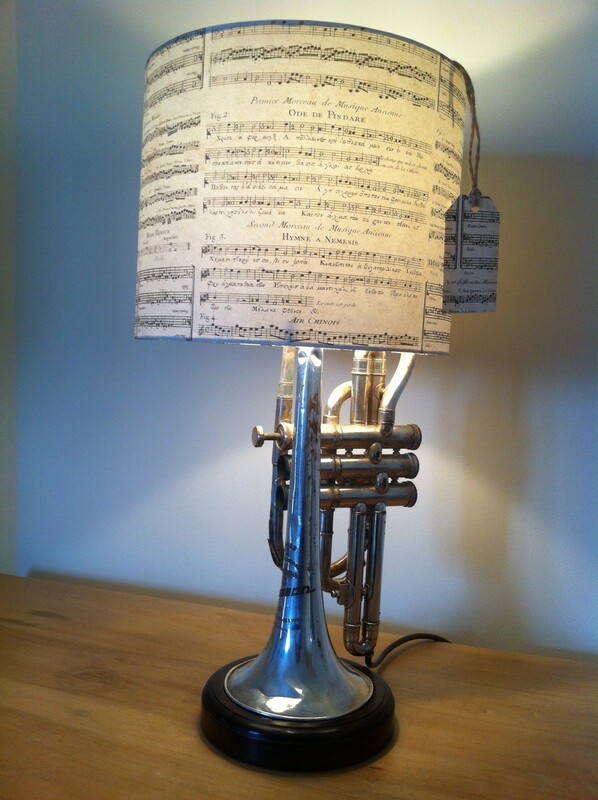 The lamp shade is hand made from Italian music score paper and is lined using fire retardant pvc, that meets uk standards. 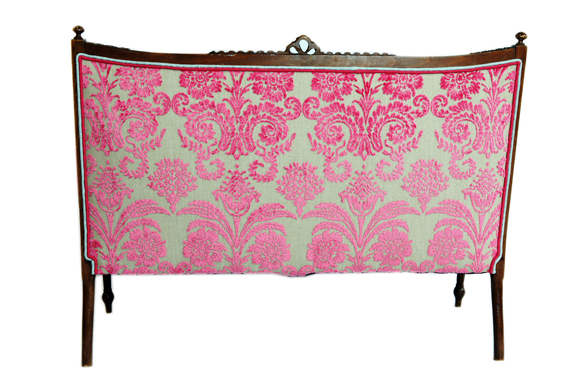 Height of lamp and shade: 30 inches. 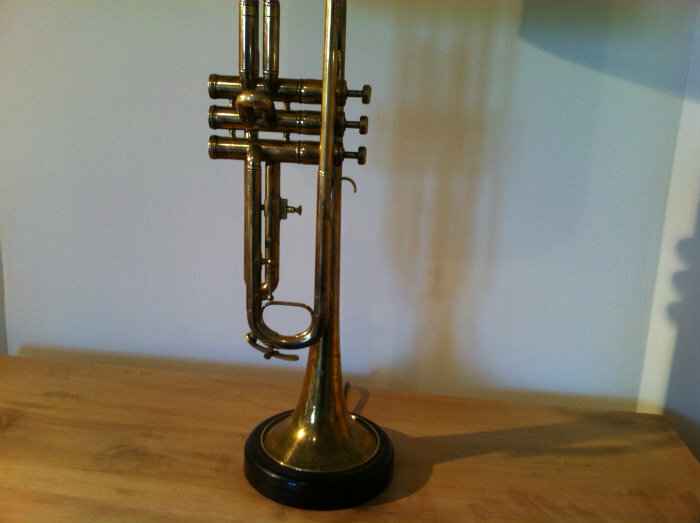 This vintage non-playing trumpet has been mounted on a polished wooden base and converted into a contemporary lamp. 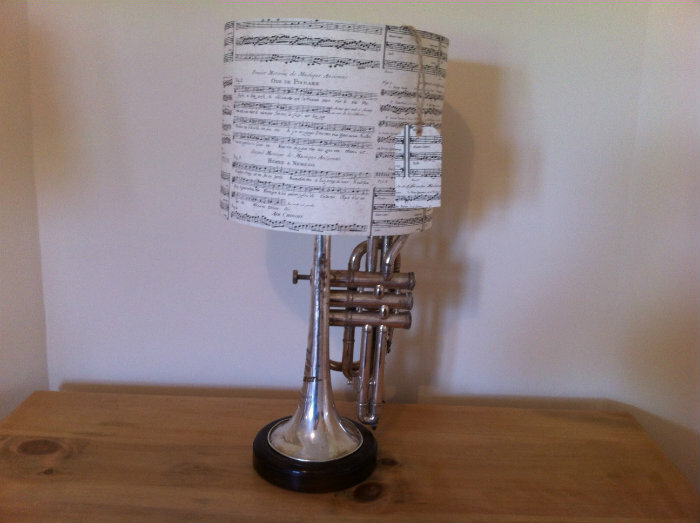 The lamp shade is hand made from Italian music score paper and is lined using fire retardant pvc, that meets uk standards. 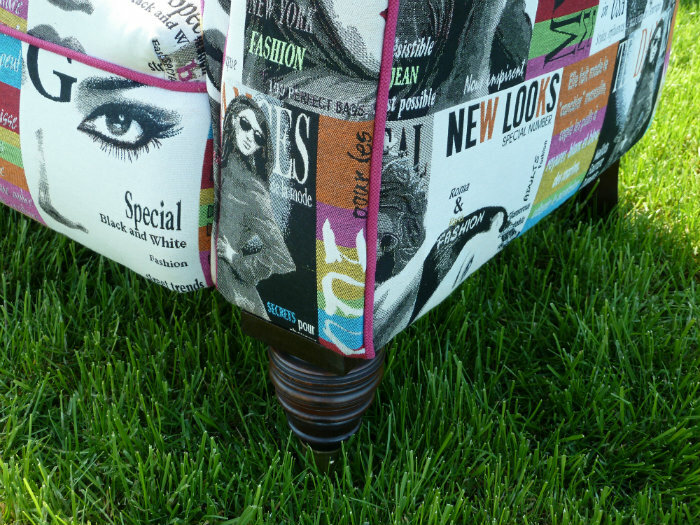 Height of lamp and shade: 20 inches. 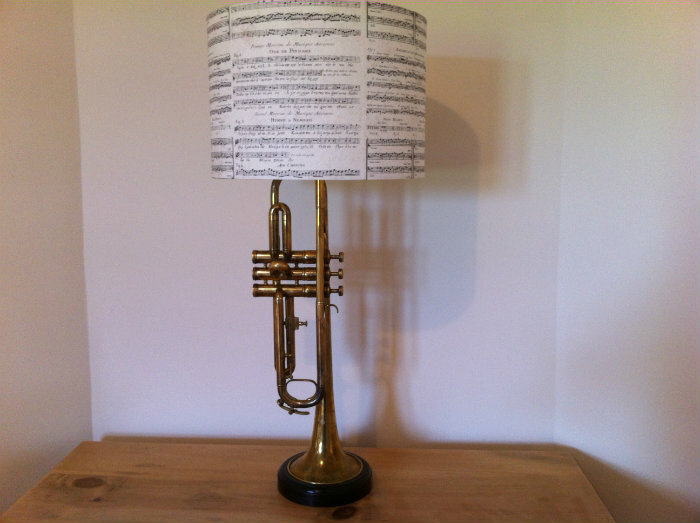 Height of lamp and shade: 27.5 inches. 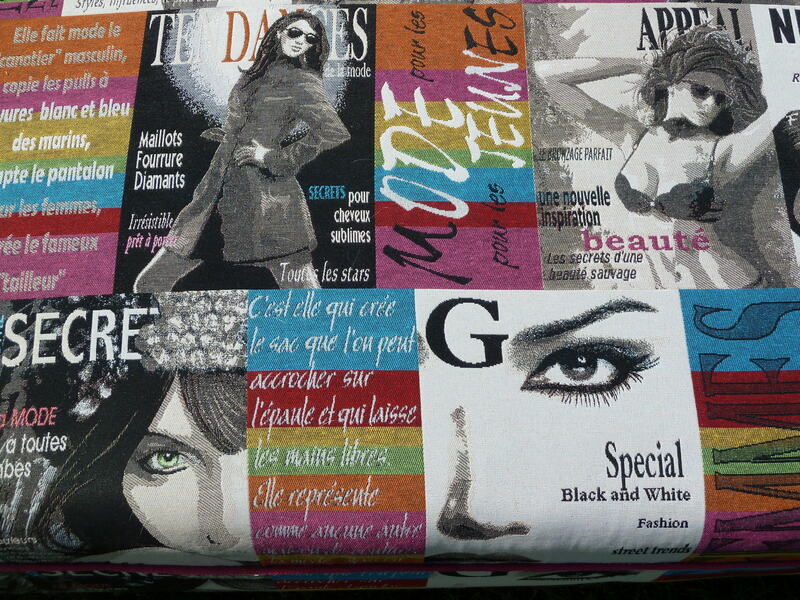 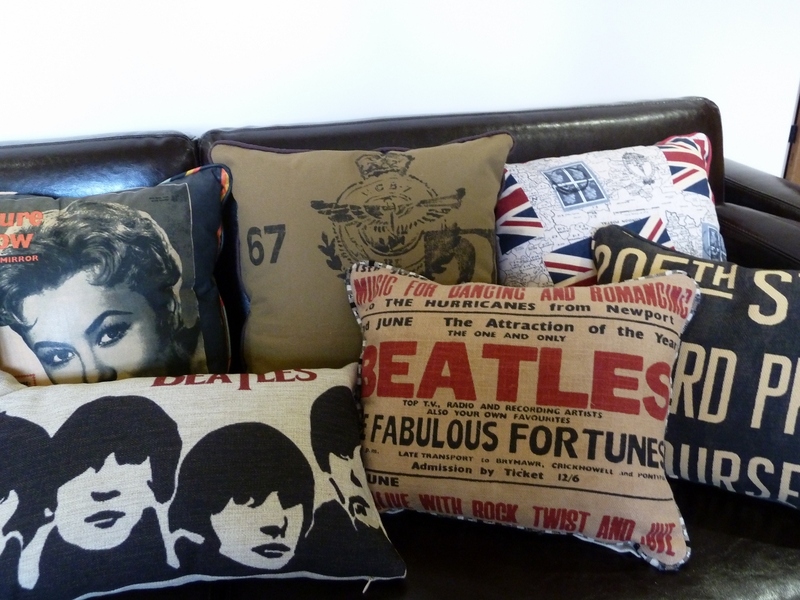 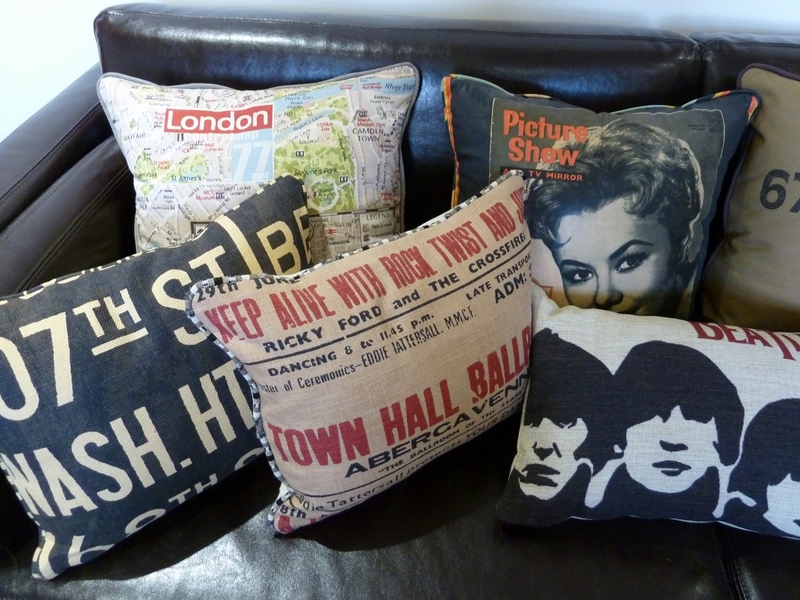 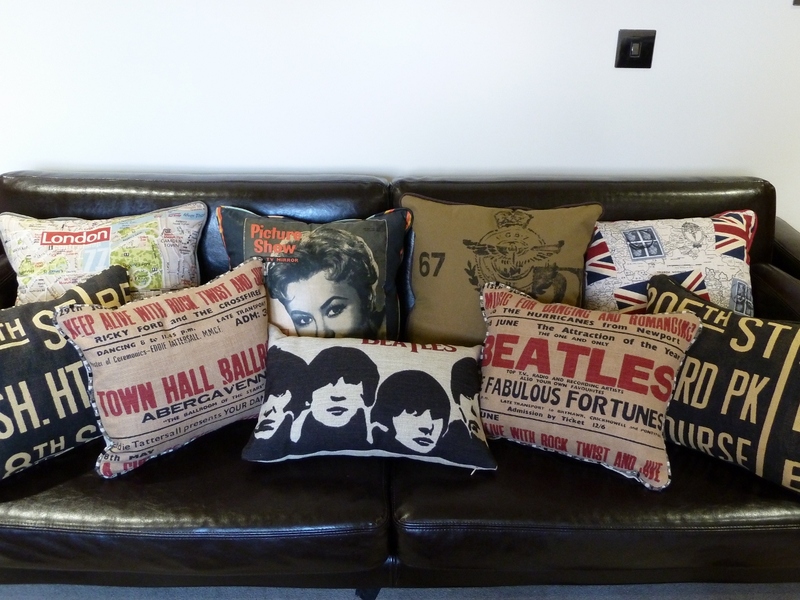 We always have a great selection of bespoke cushions in stock and can also make cushions to order. 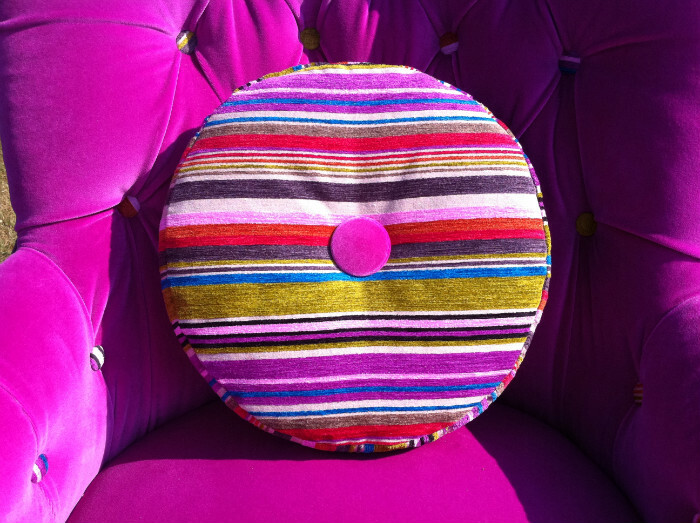 Please contact us with your enquiry. 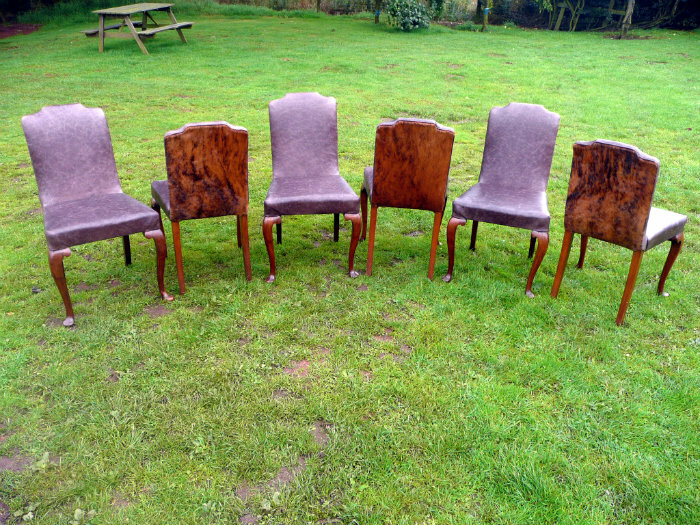 This quality set of 6 walnut dining chairs are in the style of Queen Anne with lovely sabre front legs and curved back legs. 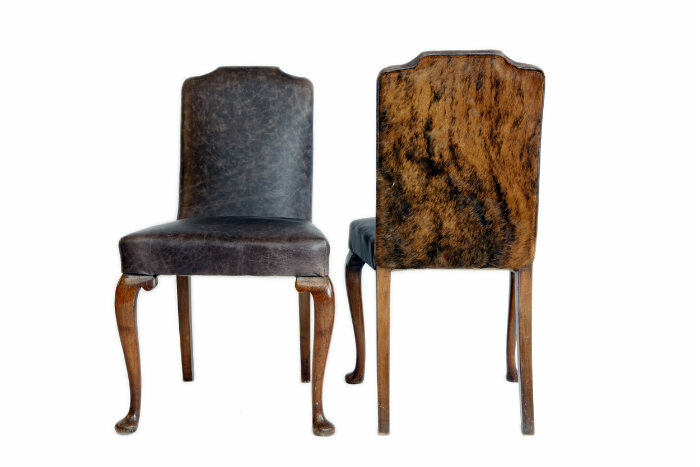 The chairs date to around 1920 and still have their original fillings. 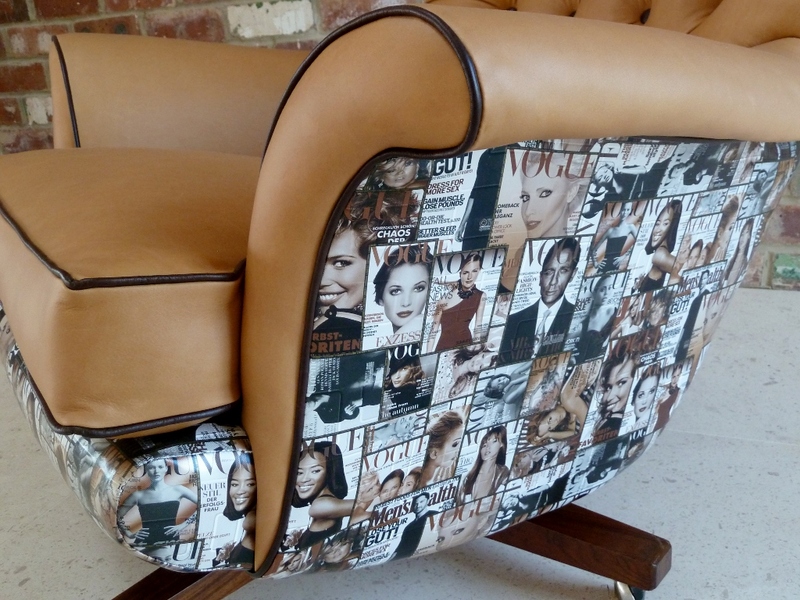 All 6 chairs have been traditionally re-upholstered in an exotic cow skin to the backs and a matching premium leather to the inside backs and seats. 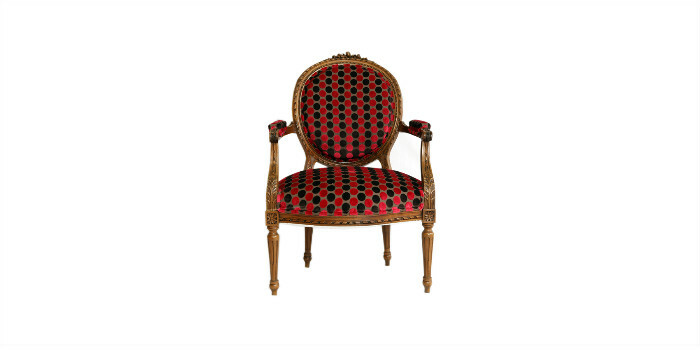 This is a great opportunity to own a set of unique designer antique dining chairs. 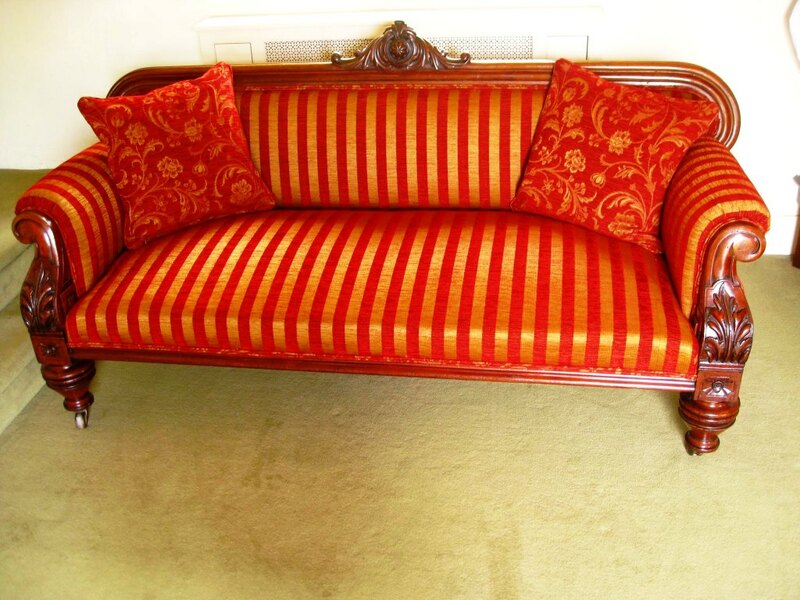 This beautiful well made mahogany sofa is of great quality standing in its original condition. 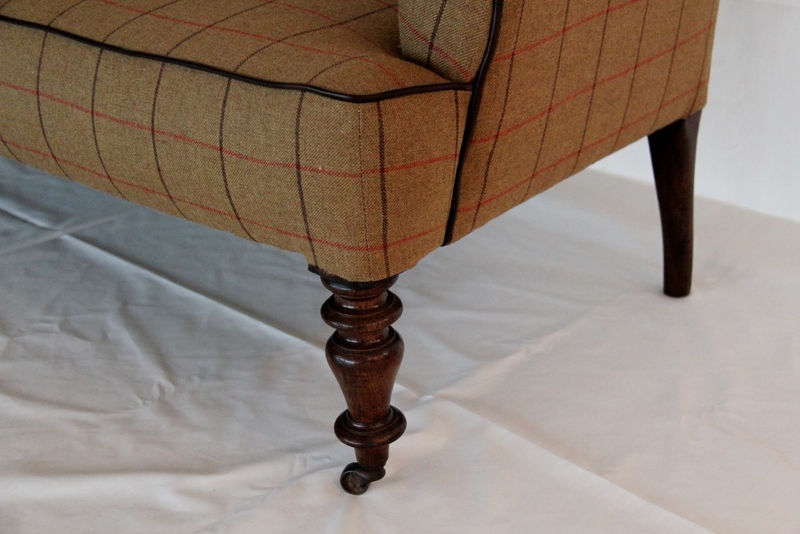 The frame has been waxed polished and the material replaced with a striking red and gold which has been finished off using self piping. 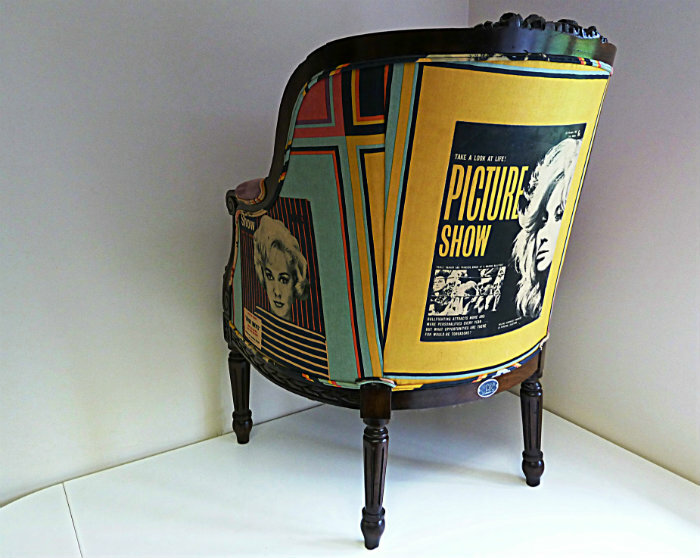 A fantastic piece to compliment a hall or sitting room. 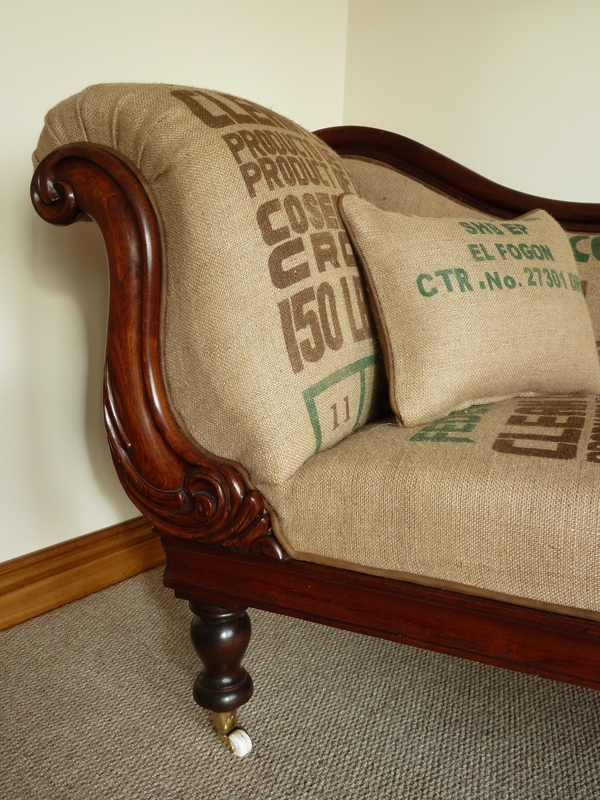 This lovely looking day bed with deep buttoned back and matching cord stands on 4 turned walnut legs with porcelain castors in its original condition. 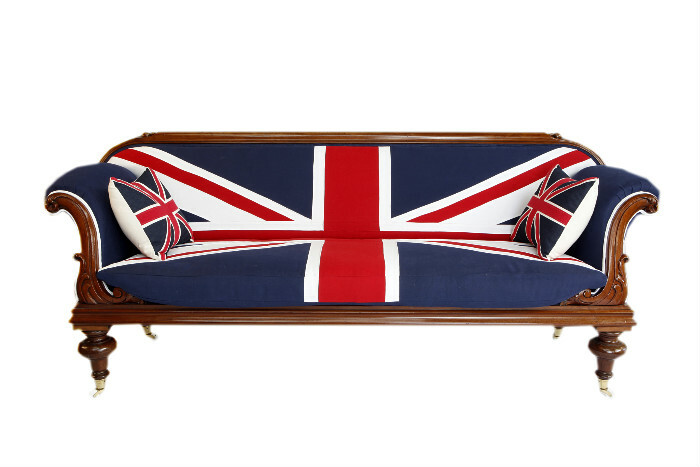 The day bed was taken back to the frame and rebuilt securing the original springs. 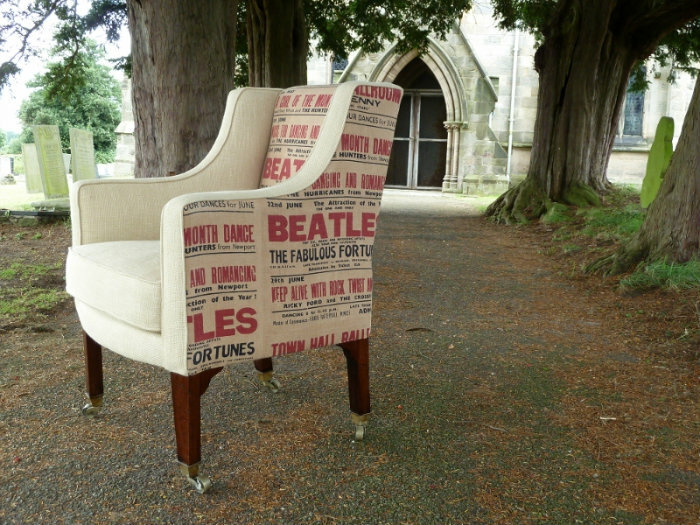 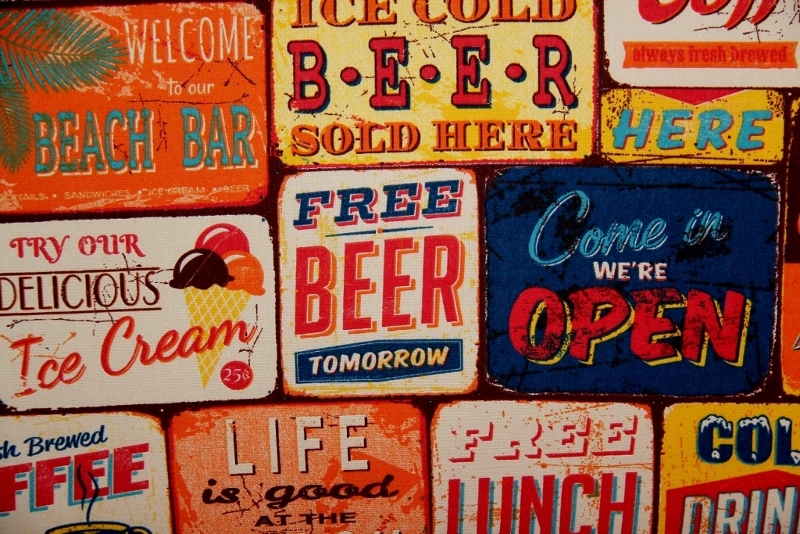 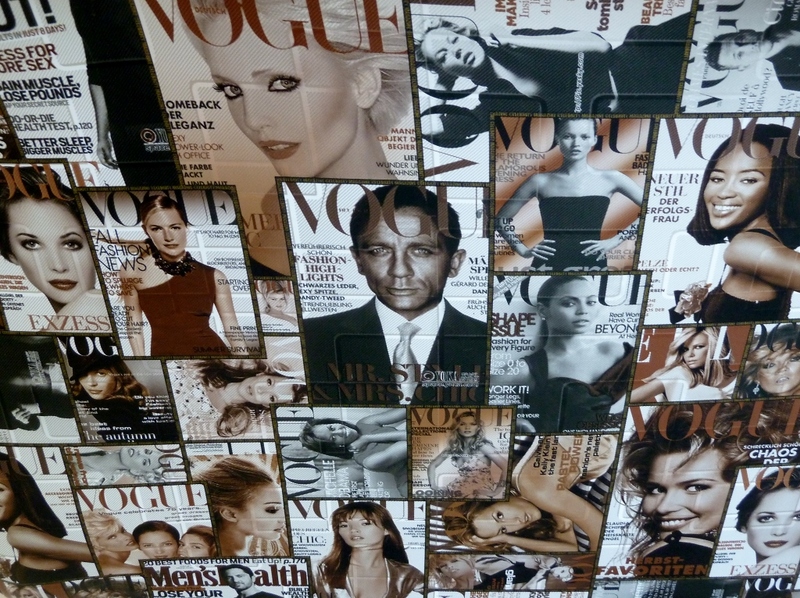 The original filling was reused and firmed up using traditional methods and recovered in a contemporary designer fabric. 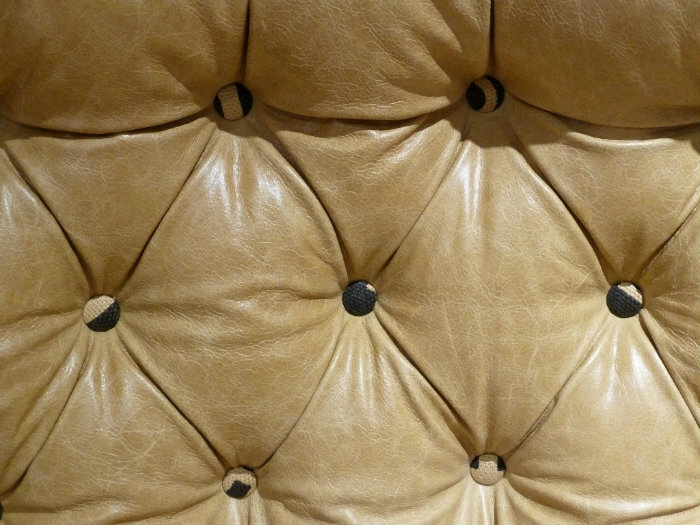 This bespoke sofa has been had all four legs re-polished and the upholstery re-sprung. 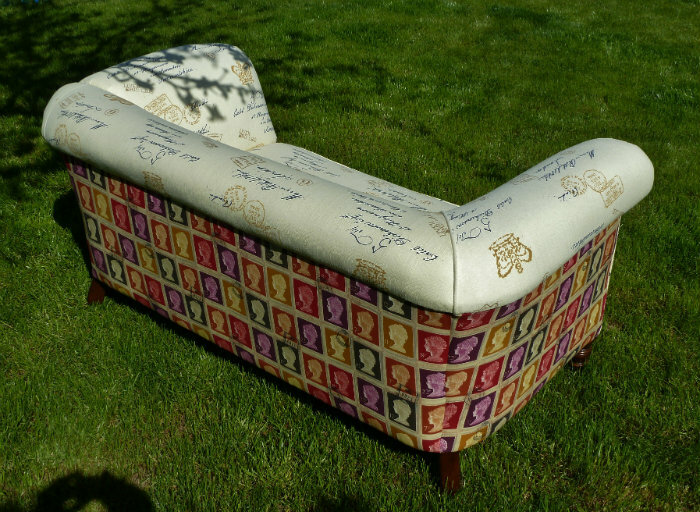 Re-covered using Andrew Martin first post material on the main body and stamp fabric on the front border and outside this drop arm sofa looks stunning and will compliment any room. 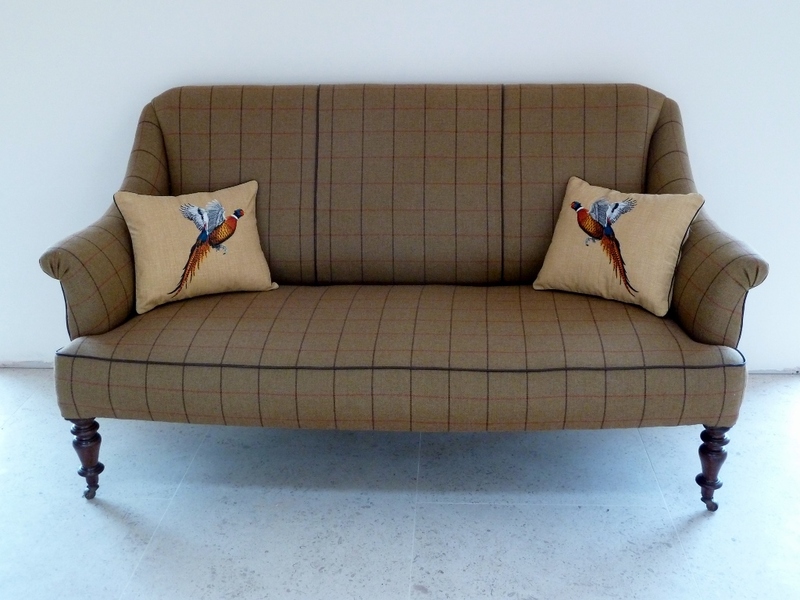 A beautiful shaped Victorian sofa upholstered in high quality 100% Lowland wool tweed and brown leather piping with a pair of embroidered pheasant scatter cushions. 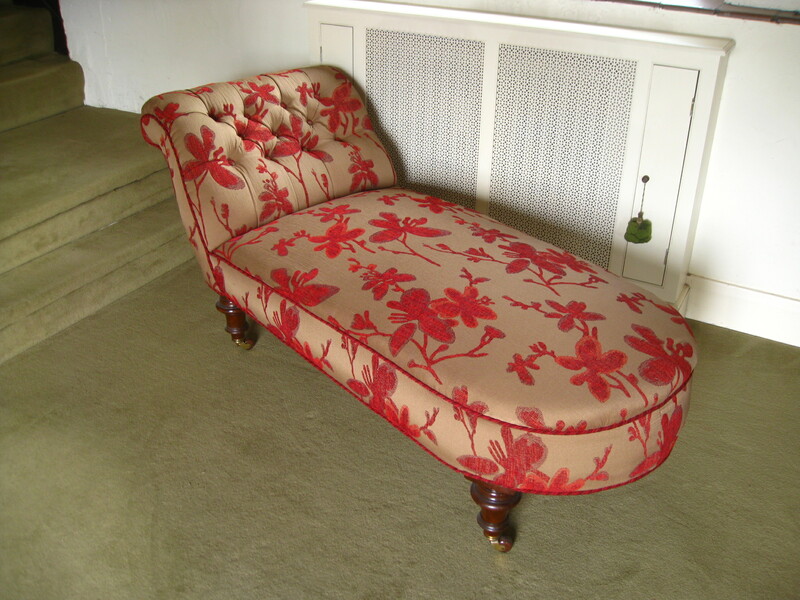 Attractive early Victorian mahogany chaise longue, on turned legs and porcelain castors, from a Victorian house in London. 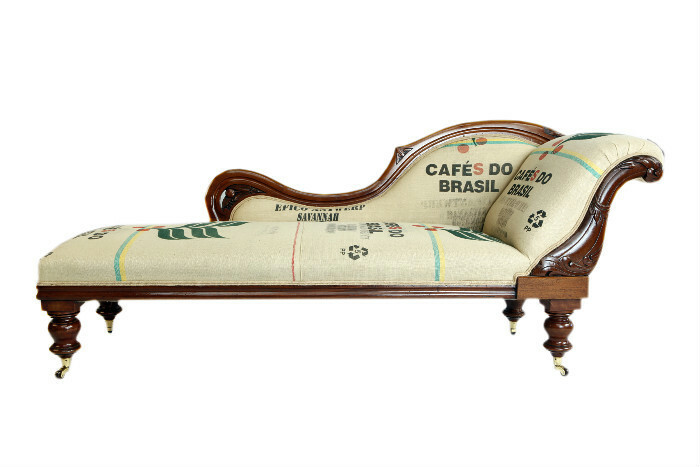 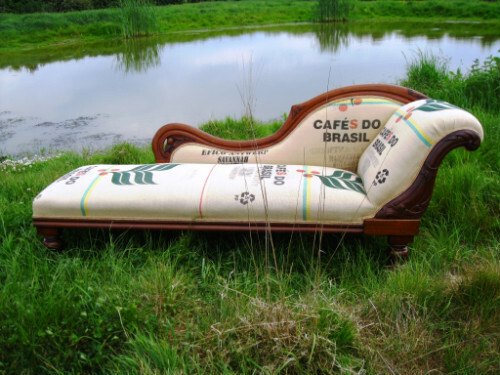 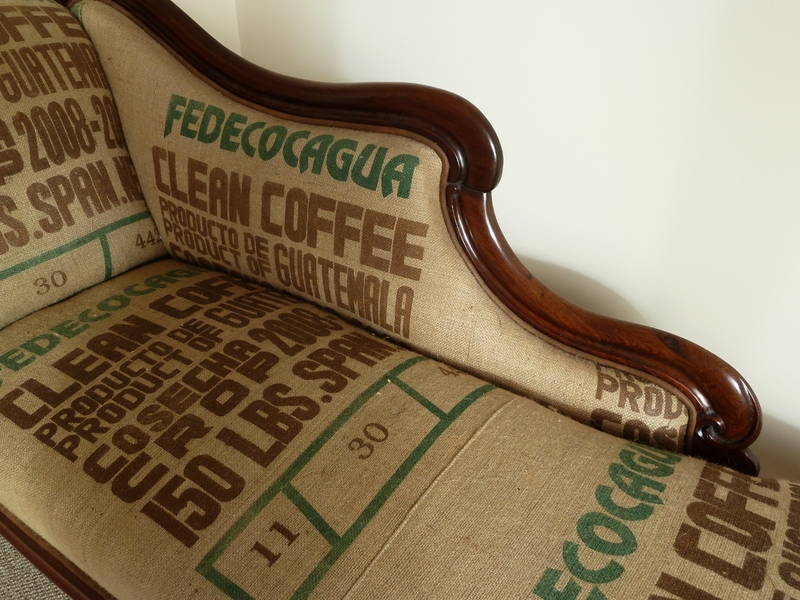 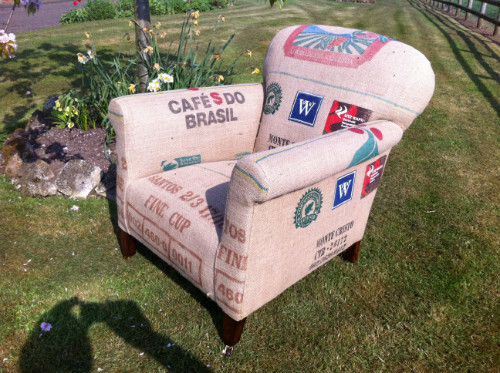 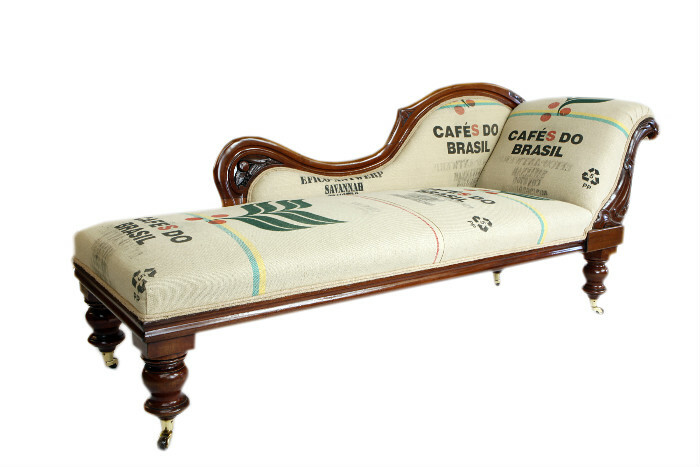 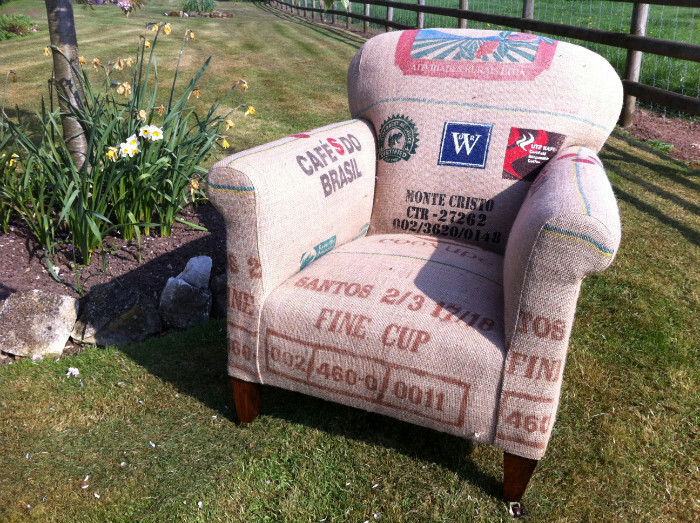 The chaise has been upholstered using old hessian coffee sacks from Brazil. 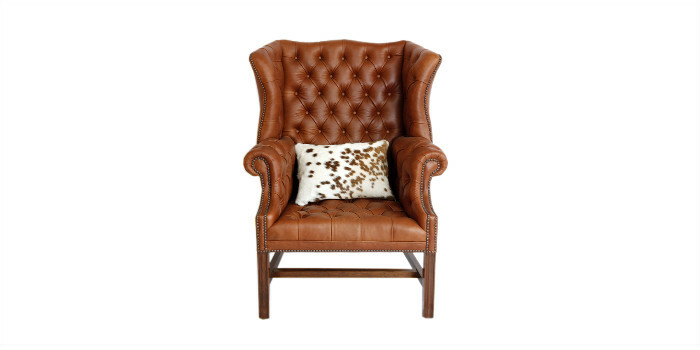 Charming gentleman's deep buttoned wing chair with mahogany moulded front legs supported by stretchers, upholstered using the finest top grade tan leather and contrasting tri colour cow hide to the outside back, and finished with brass studs. 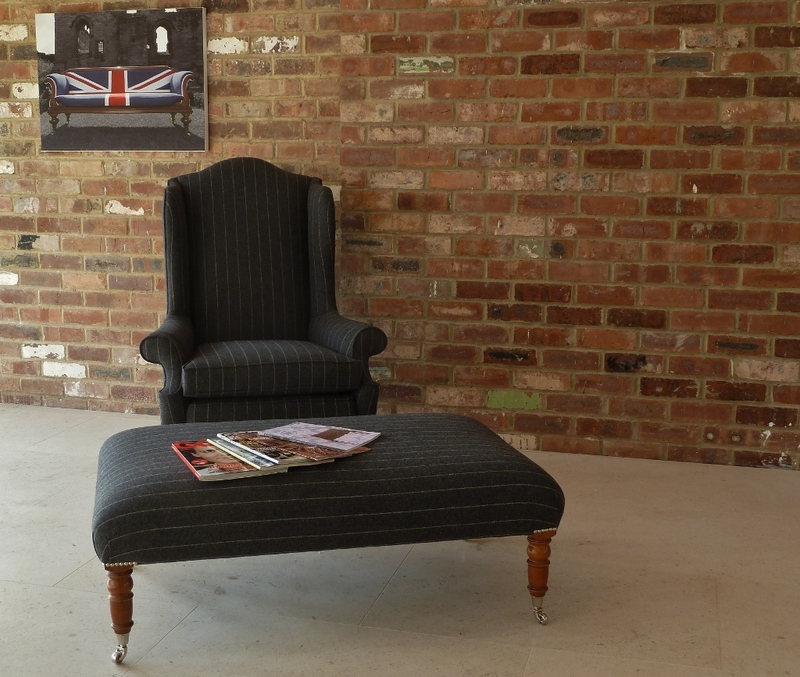 An elegant Victorian iron framed buttoned back, ladies chair on turned mahogany legs with porcelain castors upholstered in designers guild velvet and stripe. 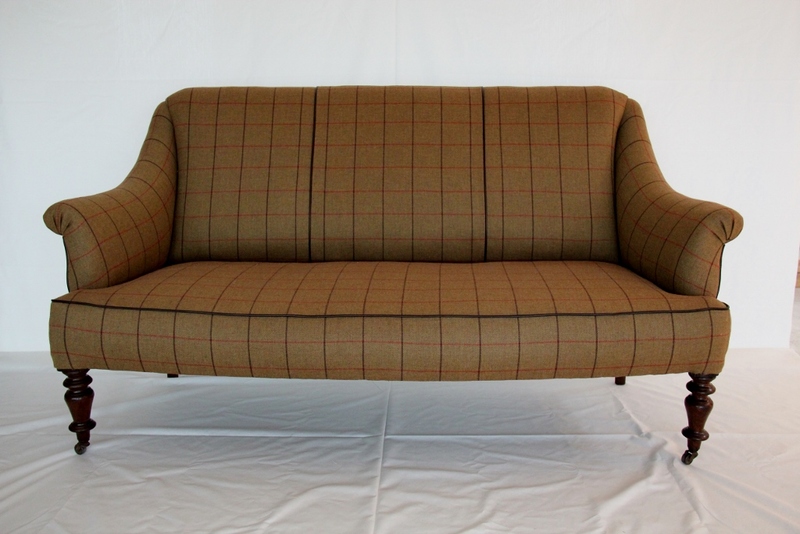 This well proportioned bespoke sofa has been had all four legs re-polished and the upholstery re-sprung. 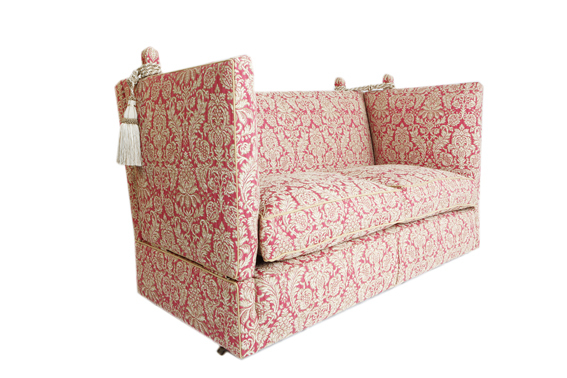 Re-covered in designer fabric showing magazine front covers and piped in contrasting cerise this designer sofa looks truly stunning. 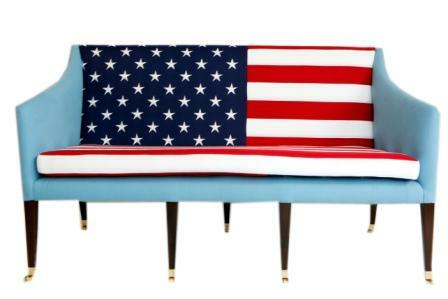 Dimensions: Width 76 inches, Depth 31 inches, Height 28 inches. 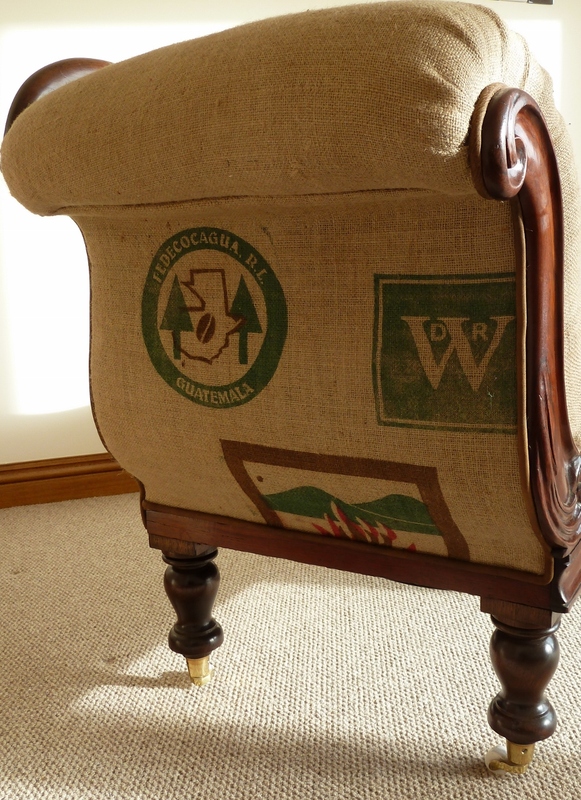 A beautifully proportioned William IV walnut sofa with scroll arms on turned legs and porcelain castors. 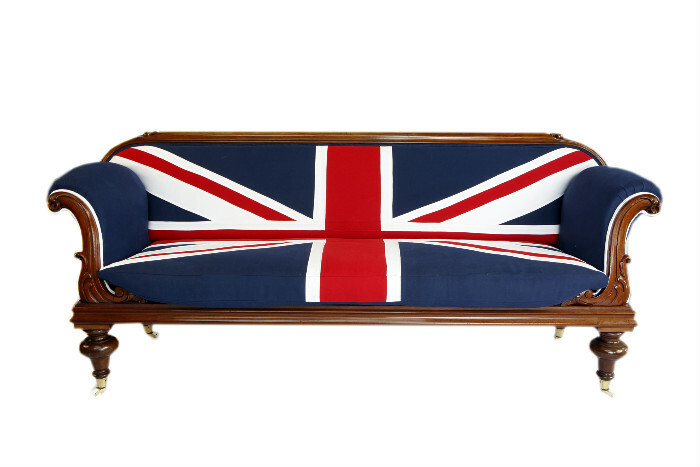 This sofa came out of a lovely period house in Bath and has been upholstered using Romo fabrics in the style of the Union Jack flag, this bespoke sofa would grace any venue. 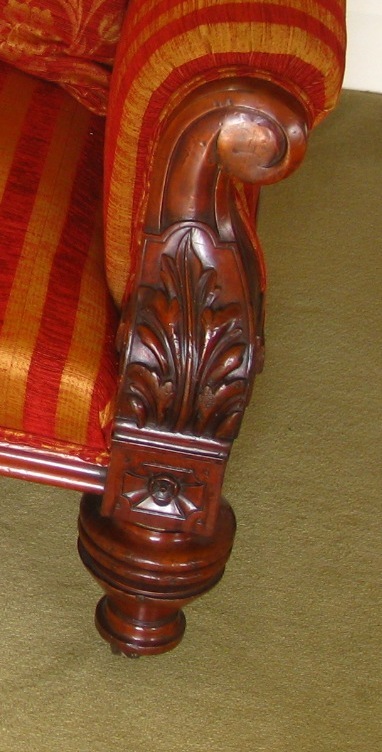 A Louis XV walnut canapé, with moulded rail centred by flowers above a padded back and sprung serpentine seat on moulded cabriole legs. 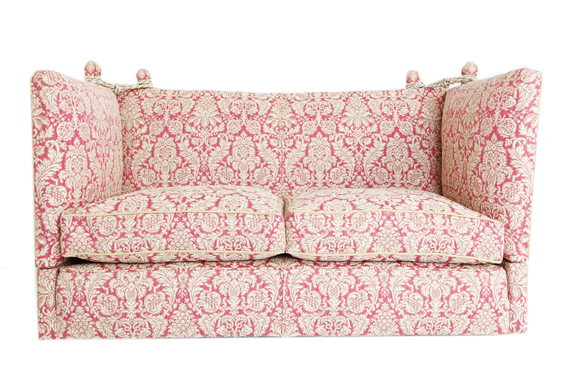 This great looking sofa was set in the same family home in Paris for more than 100 years. 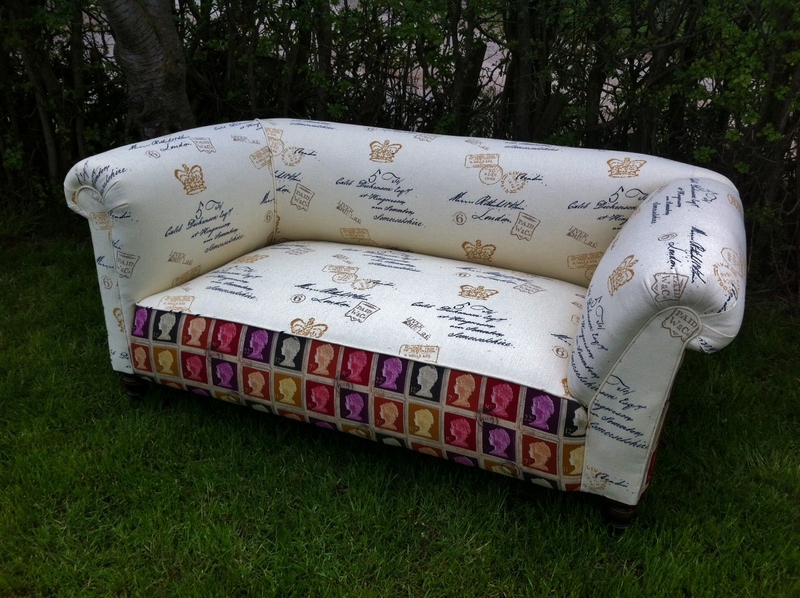 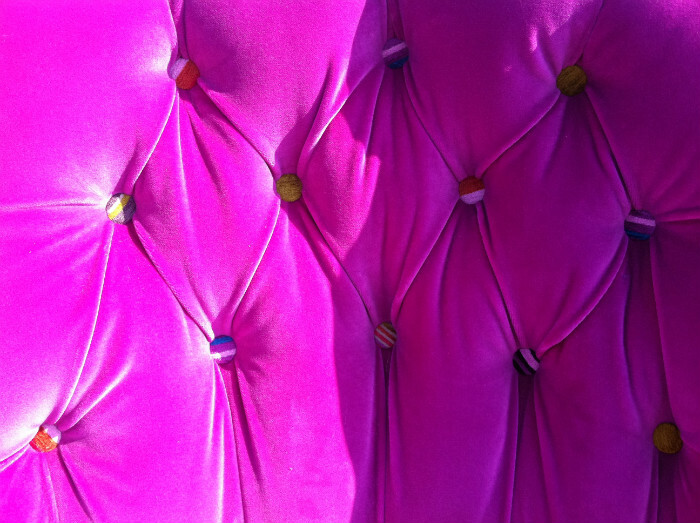 It has been upholstered using fabrics from Andrew Martin to create a bespoke designer sofa. 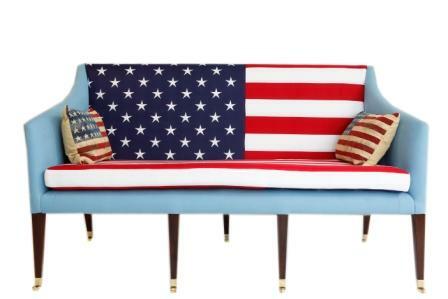 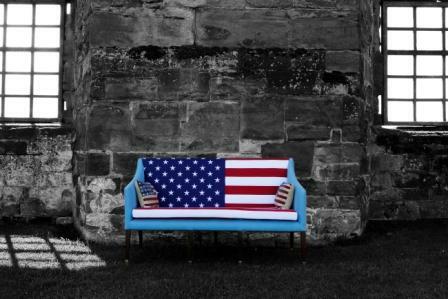 A luxury square back arm settee on mahogany square tapered legs and brass castors upholstered using the United States of America stars and stripes flag. 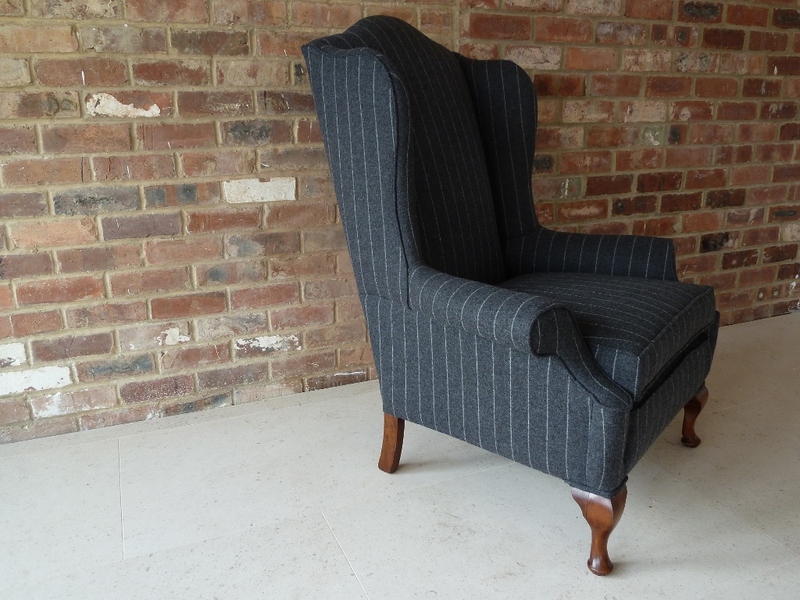 A late Edwardian wing chair with arched padded back and scrolled arms. 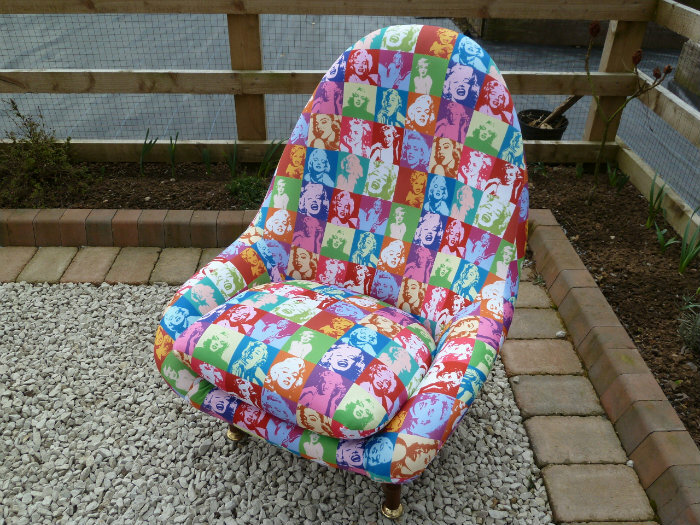 The seat interior has been replaced for comfort and the chair's upholstery is in Andrew Martin, Joker fabric. 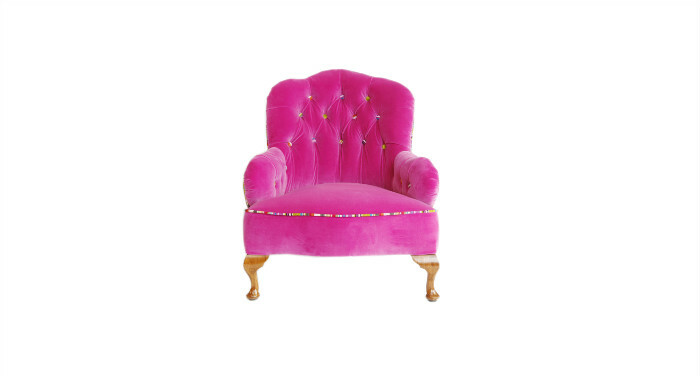 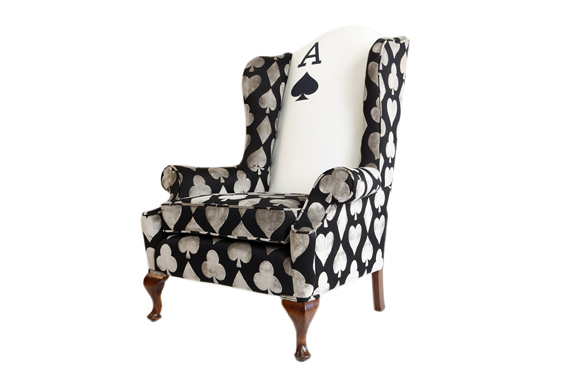 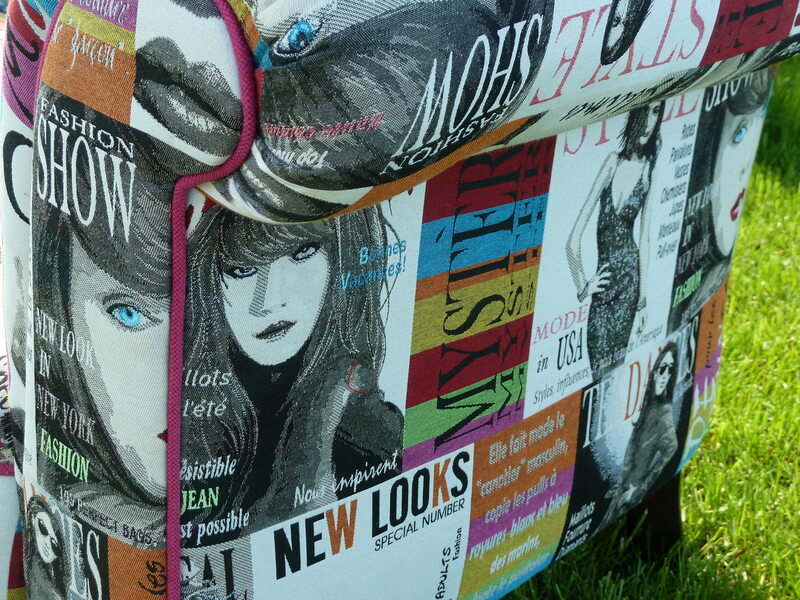 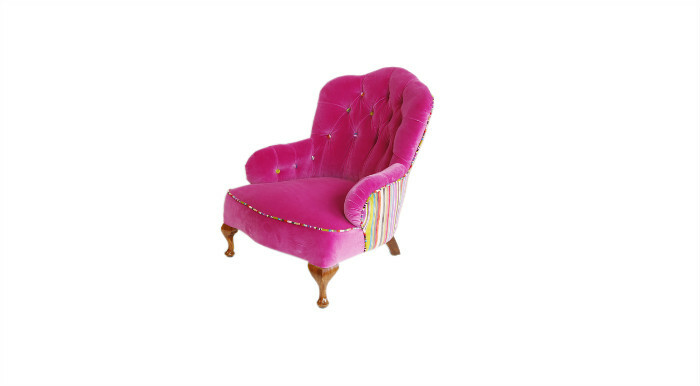 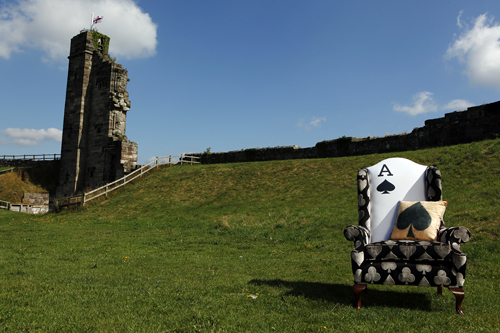 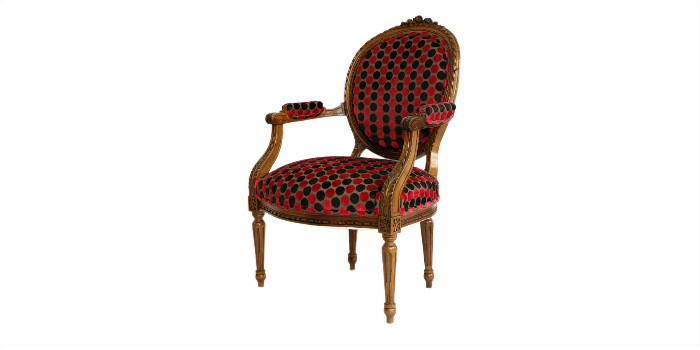 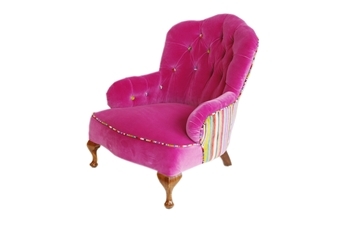 The custom made ace of spades inside back has been designed by Antique 2 Chic and printed to add individuality to produce this Ace designer chair.